Delicious Korean Recipes!! | Teaching English in Korea! Category Archives: Delicious Korean Recipes!! If you make it to Korea and want to venture out into the local market, here is a way to navigate your way through the maze and find some really delicious recipes. Always remember, kimchee and rice go with every meal! 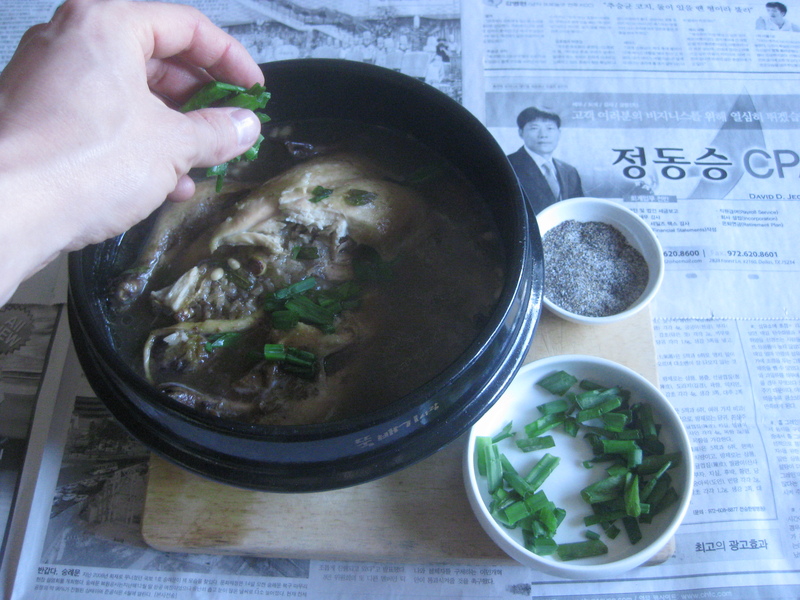 삼계탕 Sam-Gye-Tang — a summer stew! 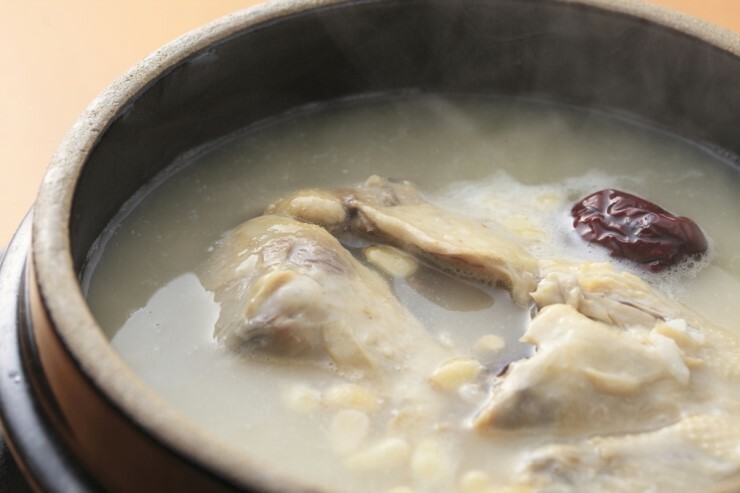 Samgyetang is a popular dish eaten during the hottest days of summer. 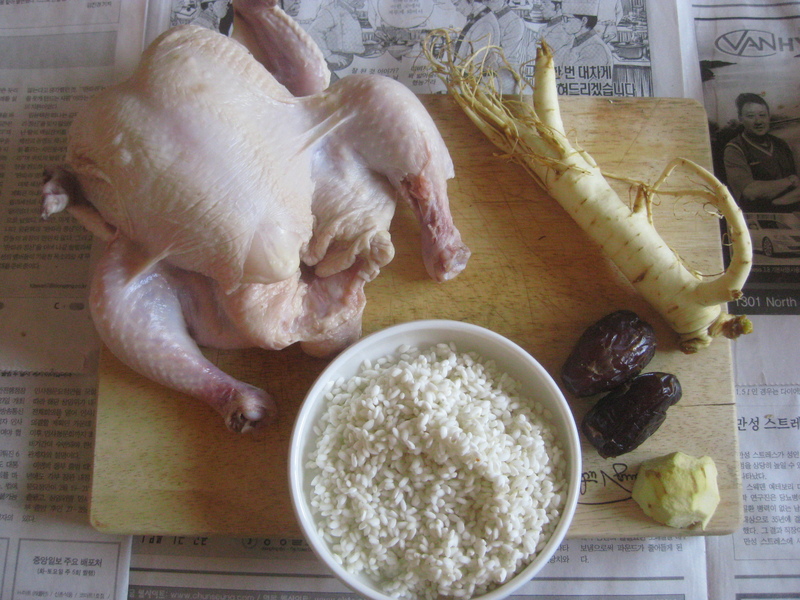 It consists of chicken, ginseng root, chestnuts, sticky rice, dates and pine nuts. 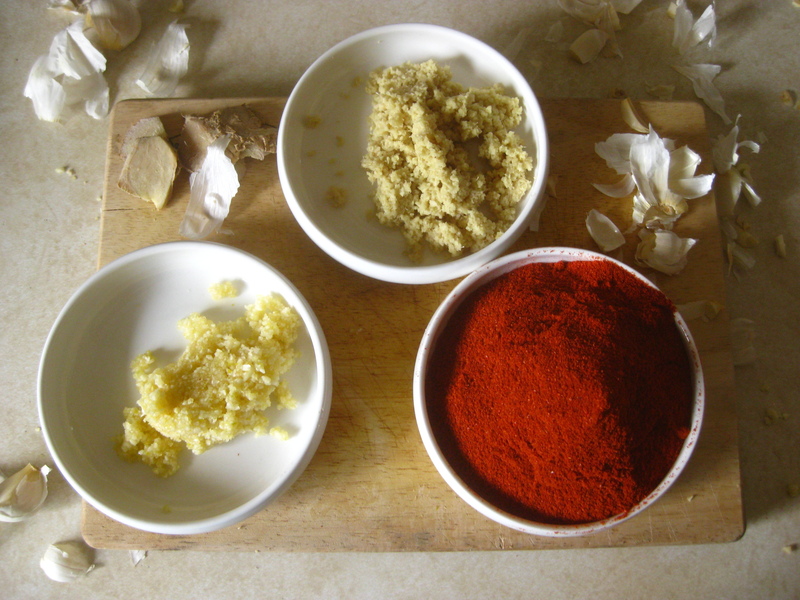 These ingredients may be unfamiliar to you, so during the post, I will have photos of the ingredients. 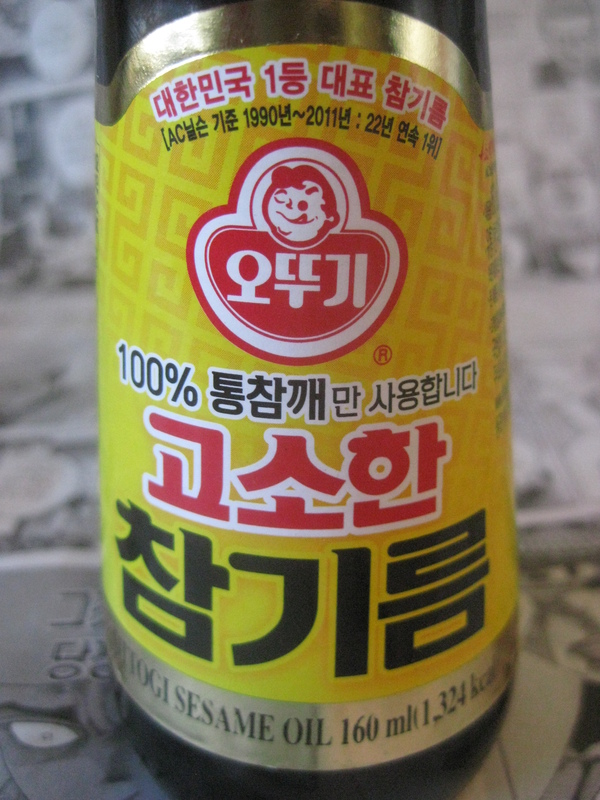 I will also include a list of the ingredients written in the Korean language. If you would like, print the out the ingredients in Korean and use it as a cheat sheet. When you arrive at the market, just show someone and they will be more than happy to help you. Korean people can be very endearing and they are some of the most helpful people I have ever met. Before I send you on a mission to buy ingredients for Sam-Gye-Tang, I wanted to give you the chance to really get into the culture, so I listed some items below that are integral to eating Sam-Gye-Tang. 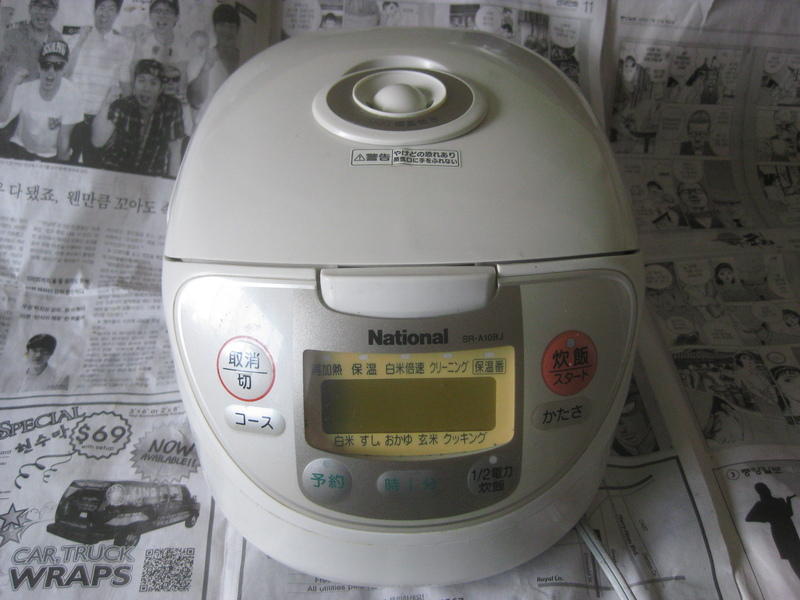 Most of these items can be found at a wholesale kitchenware store or an E-Mart / Lotte Mart. 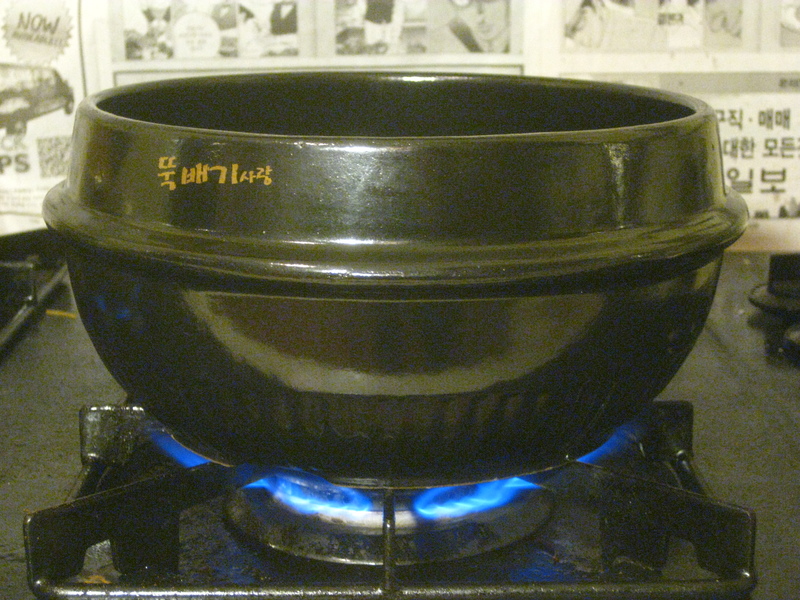 Dook-bae-gi 뚝배기 – This is a traditional-style earthen pot used for cooking fiery hot stews. The name is pronounced, “Dook-bae-gi”. .Standard cooking pot – Initially we will cook the chicken in a standard cooking pot and once the chicken has thoroughly cooked we will transfer everything over to a Dook-Bae-gi for the final stages of the process. Silverware – A pair of metal chopsticks and one soup spoon per person. 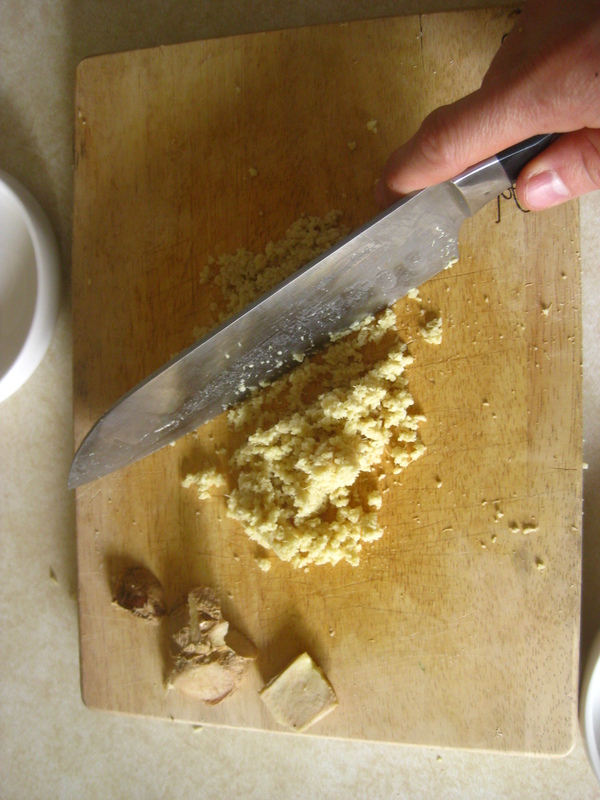 Soup Ladel – Necessary for scooping the broth out of the pot and pouring it into an individual bowl. Tupperware – One medium sized bowl per person and a small dish for salt and pepper mix to dip the chicken in as you eat And some metal rice bowls for white rice. Traditional Korean Floor Table 밥상 – Pronounced, “Bap-Sang”, this is the traditional way friends and family eat in Korea; sitting on the floor at a table that is one foot from the ground. Its a fun way to eat sitting on the floor. Traditional Korean Floor Pillows – Traditional Korean floor pillows are square and come in a bright spectrum of colors. You can find these at a pillow specialty shop or at E-Mart or Lotte Mart. 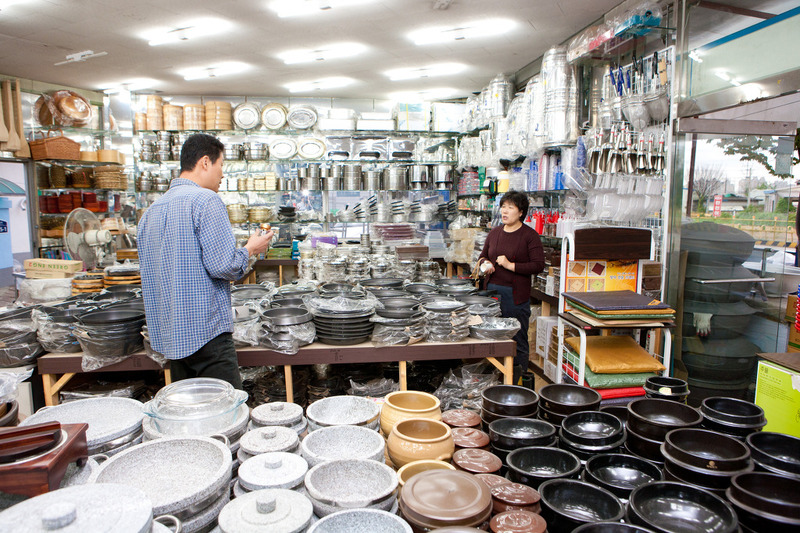 “그릇도매” is how “wholesale kitchenware store” reads in the Korean language. It is pronounced, “Guh-rut-do-may”. If you cannot locate one of these stores in your neighborhood, I suggest writing “그릇도매” onto a piece of paper so that you can show it to a Korean person when you venturing out. If you are unable to copy the Korean by hand, copy “그릇도매” using a computer and print it out at a local PC Bang(computer room). 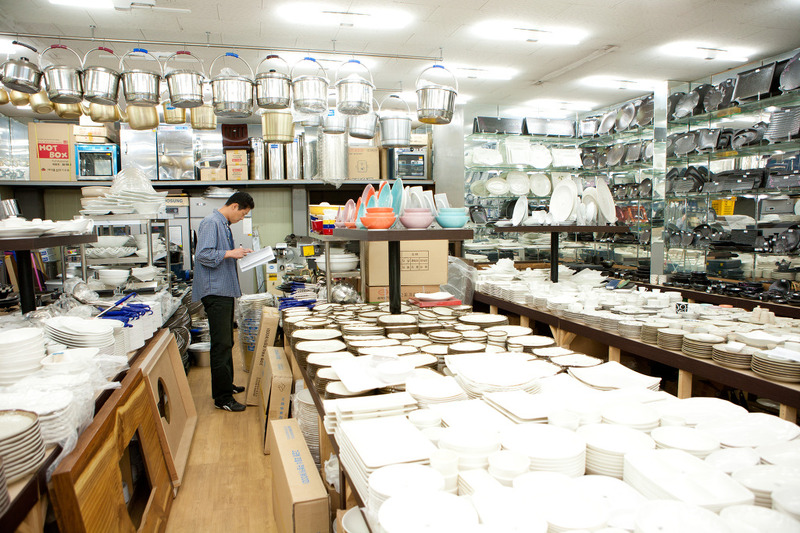 If there aren’t any wholesale kitchenware stores near you, go to an E-Mart or Lotte Mart. 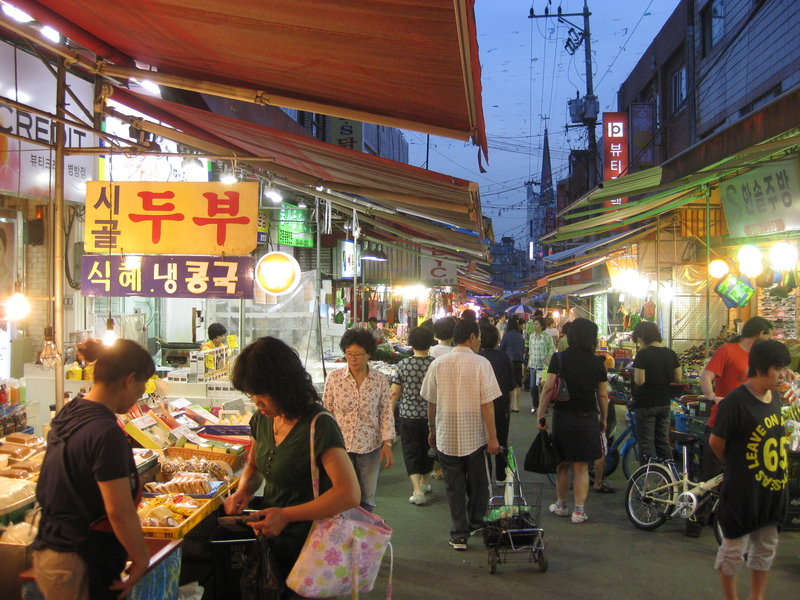 The open air market is a wonderful place to get authentic Korean ingredients. Locate one in your area and go there often. 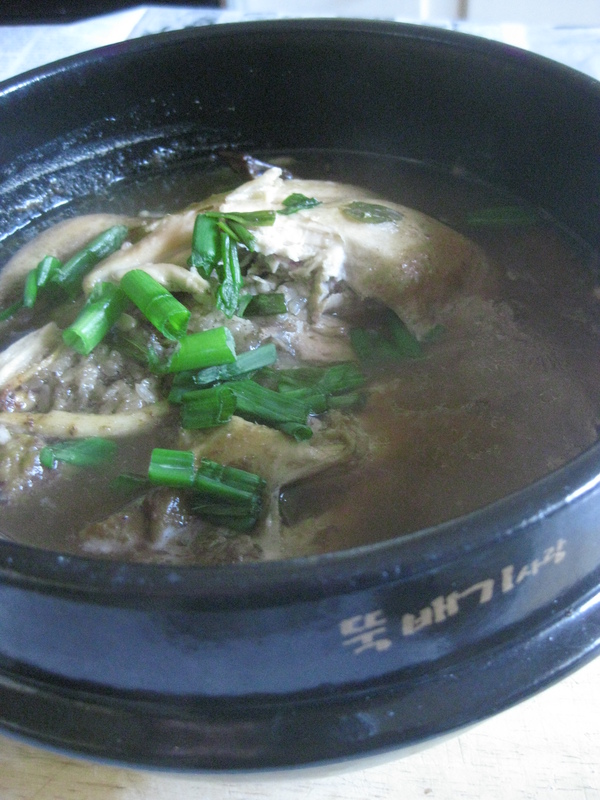 A small chicken 영계: This dish requires a smaller chicken to cook with. You can either go to the grocer and buy a chicken that has been killed already or go the market and find a live chicken and have them kill it in front of you. I think the latter is more fun. 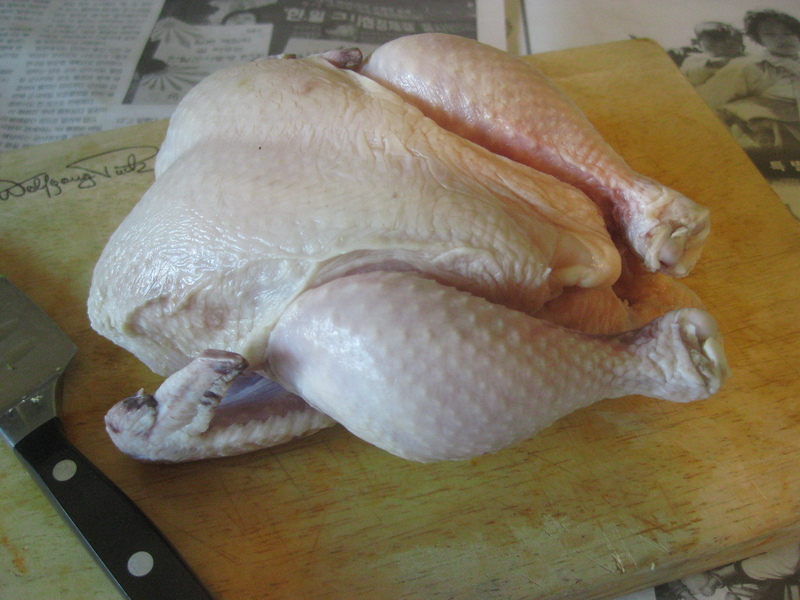 When you are looking for the right chicken find one that is around 40 to 50 days old and 450 to 500 grams in weight. If it is not possible to determine age and weight of the bird, just look for a small one. 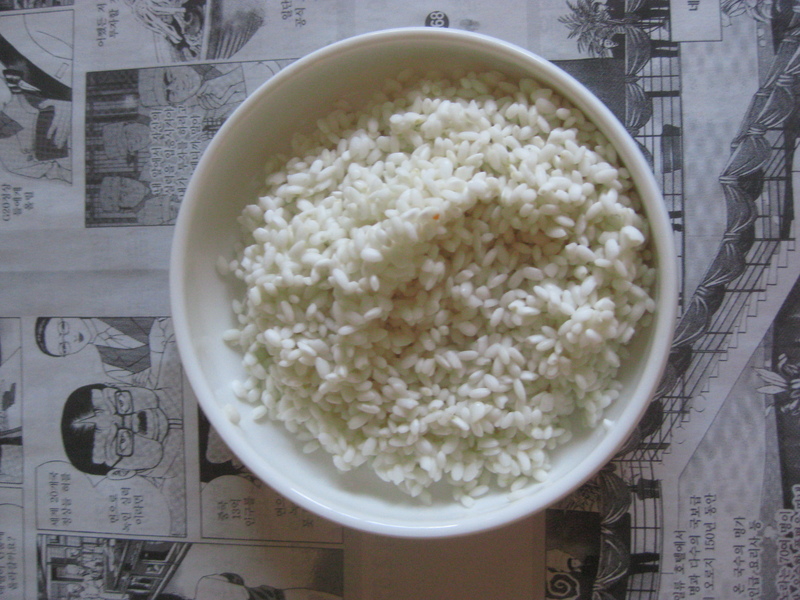 Glutinous Rice 찹쌀 : This kind of rice is different from the standard white rice you are used to eating. 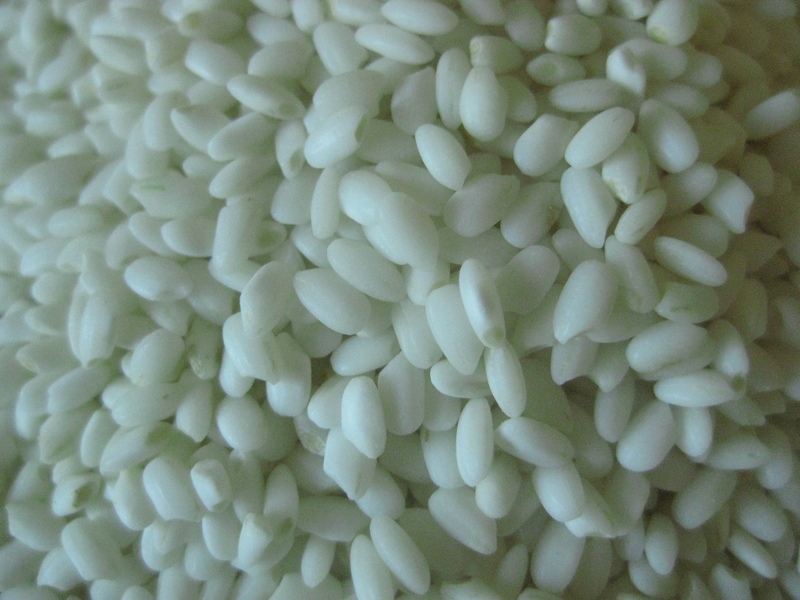 Glutinous rice, or “Chap-ssal”, is extra sticky when cooked and is sweeter than regular white rice. 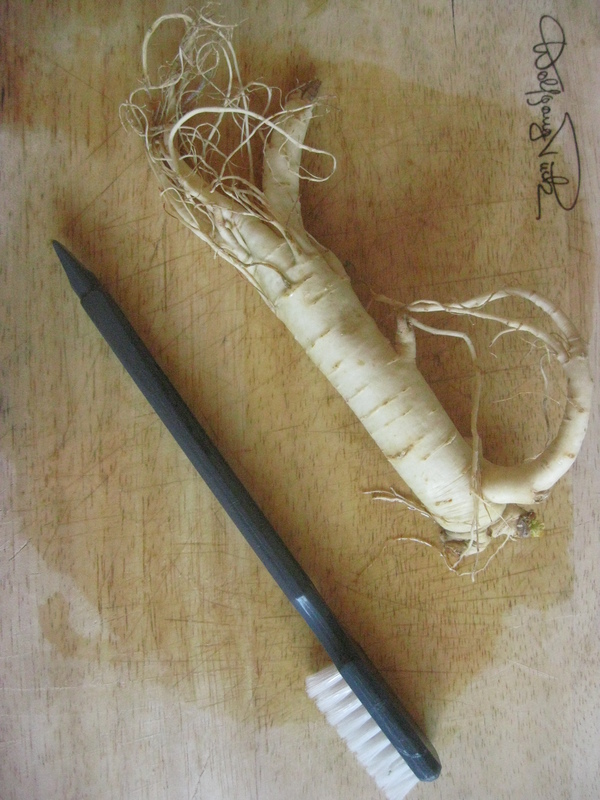 Raw Korean Ginseng 수삼: A powerful root well known in Korea for its stamina and immune boosting properties. Korean ginseng is an excellent for a foreigner trying to adjust in Korea. 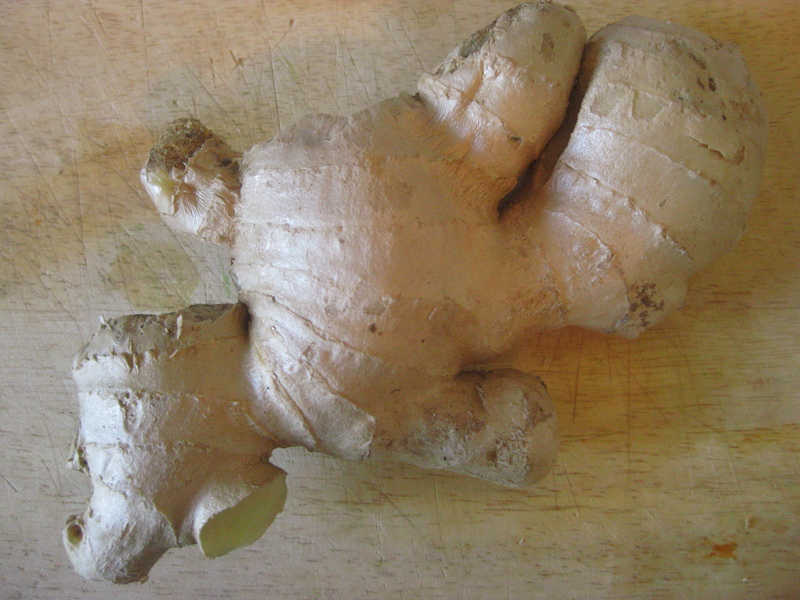 This root may look odd, but I hope that you can come to appreciate its powerful health properties. 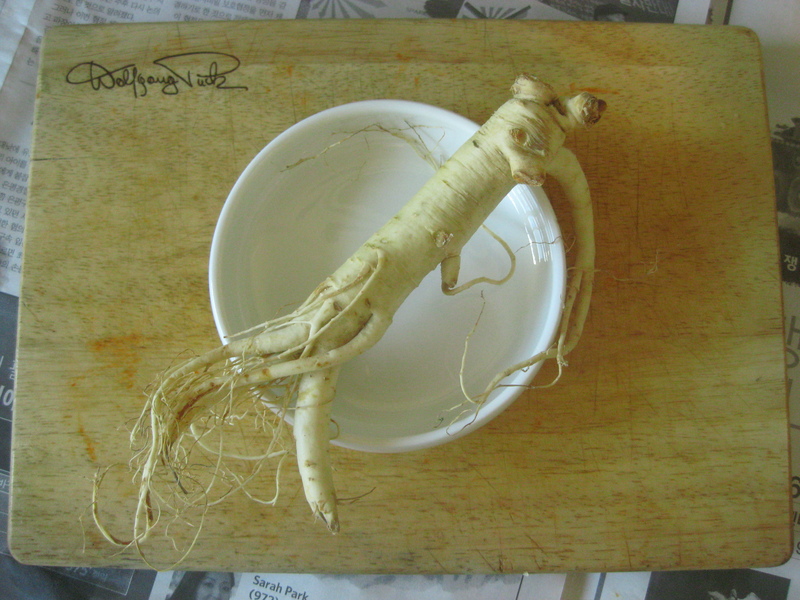 This special root can also be found at Ginseng specialty shops. 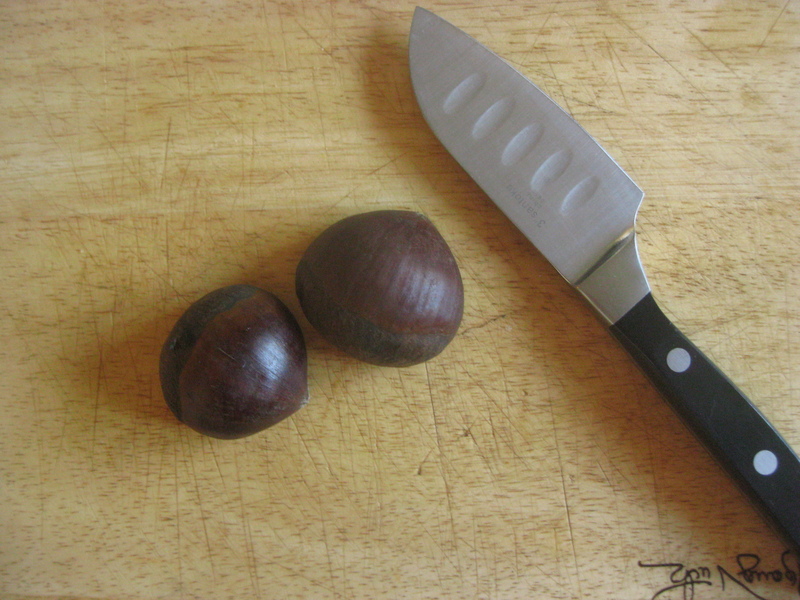 Chestnuts 밤: These kinds of nuts are dark brown and can fit inside your fist. 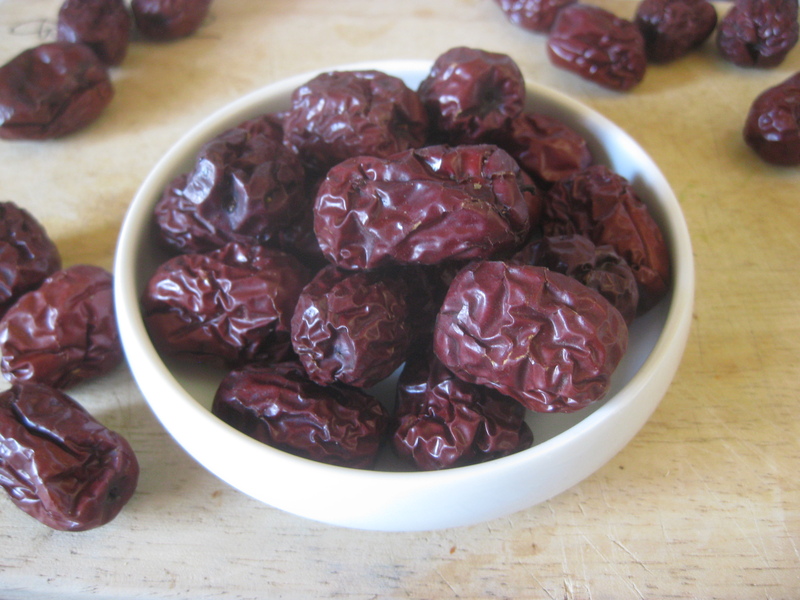 Dehydrated Chinese dates 대추: Chinese dates have a dark red color. Make sure they are dehydrated, not raw. 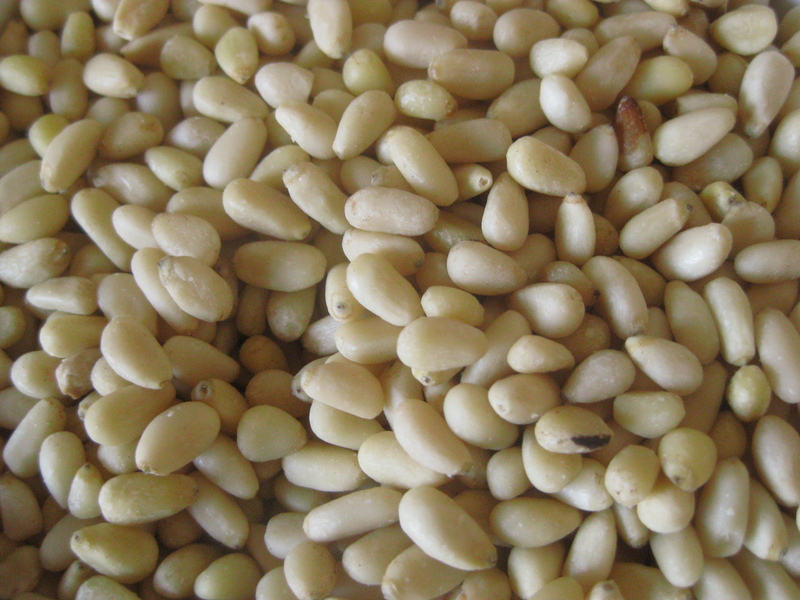 Pine nuts 잣: Pine nuts come from pine trees and resemble kernels of corn. 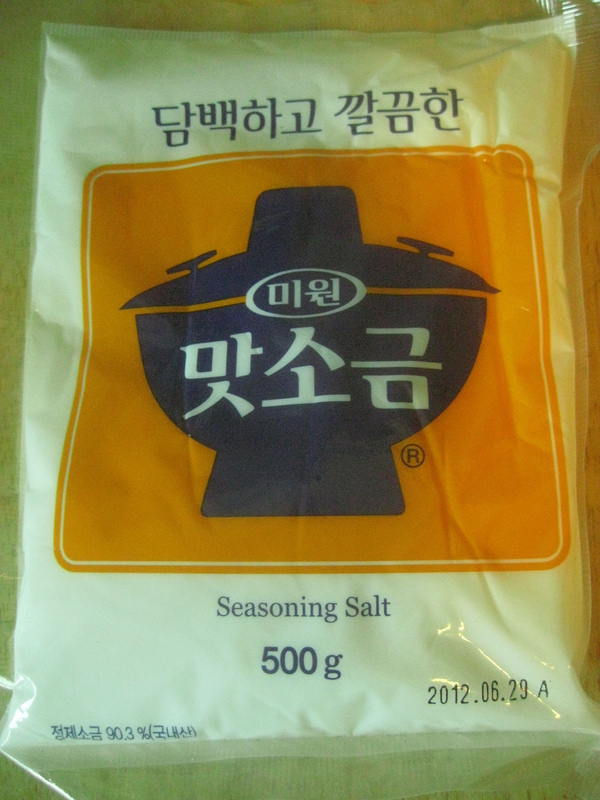 Salt : This is what a bag of salt looks like in a Korean grocery store. 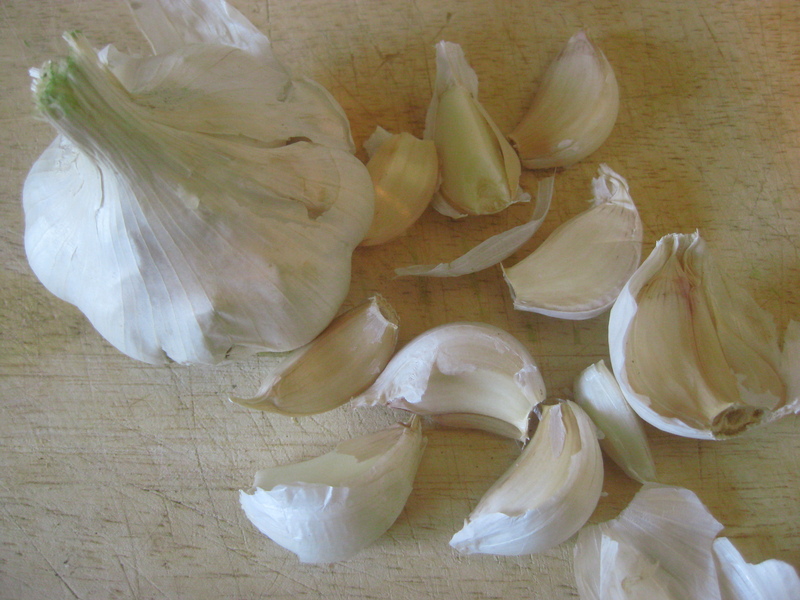 Thick green onions: Thick Green onions are different from regular green onions in that they are much longer and thicker. 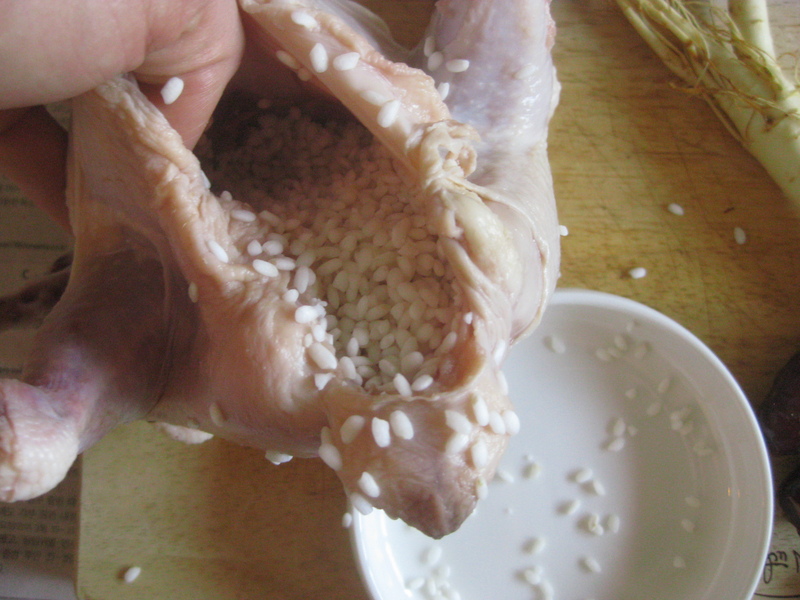 Clean out the chicken: Wash out the inside of the chicken’s stomach with warm water, then use your hand to remove any of the chickens organs if they still remain. 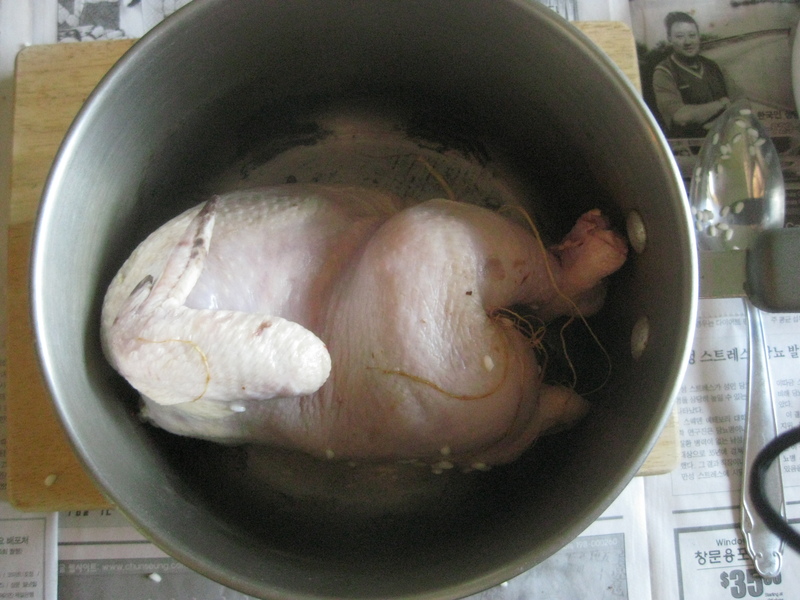 Once you have removed everything from the chickens body, then wash out the inside again until clean. Then take a paper towel and soak up any moisture inside the stomach and around the outside of the chicken as well. 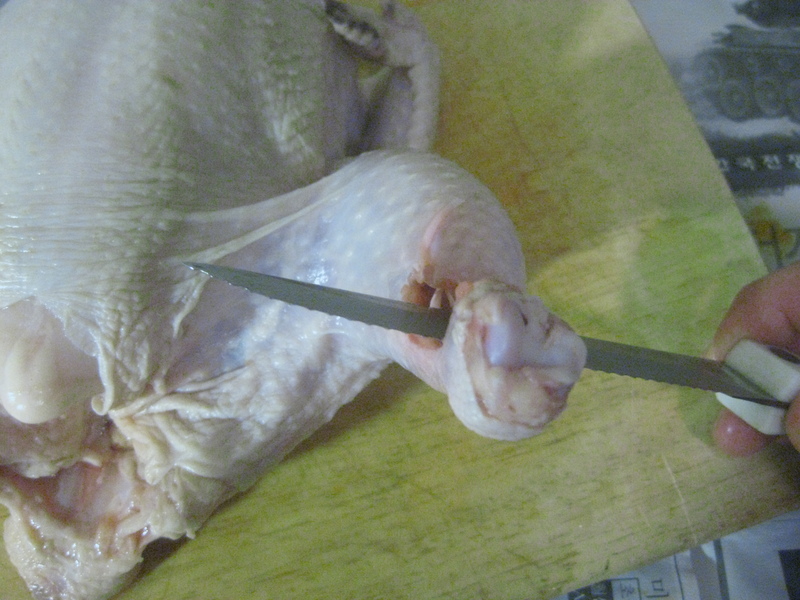 Now take a sharp knife and cut a hole into the lower part of the chickens left leg. 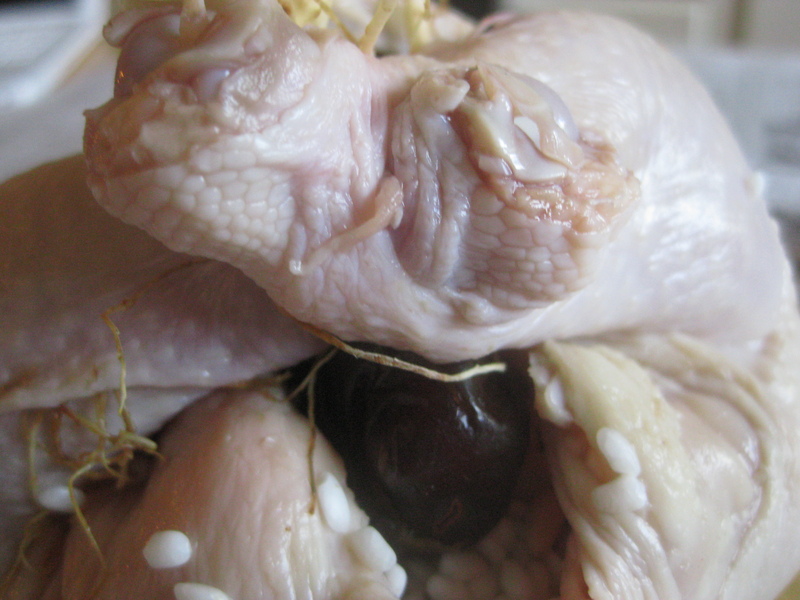 We will need to tie the chicken’s legs together later to hold the ingredients inside of the chicken while cooking. 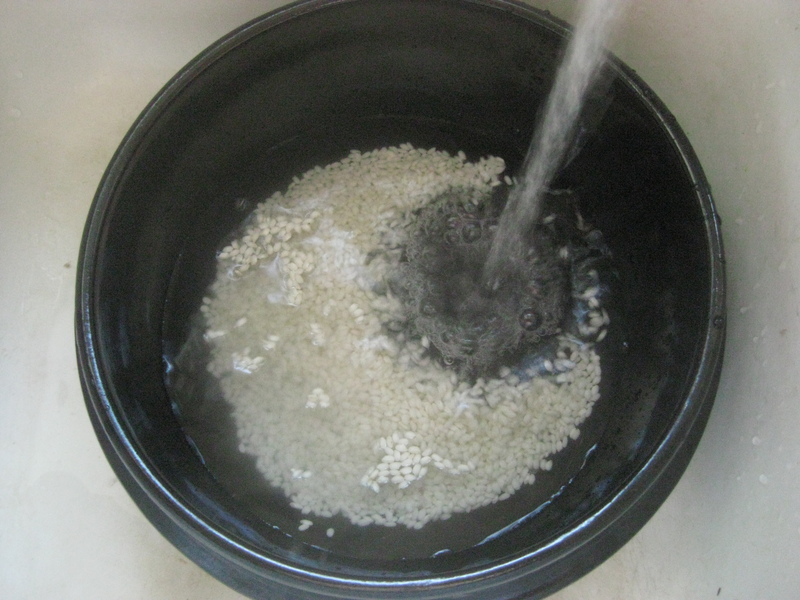 Rinse the Glutinous Rice: Put six tablespoons of glutinous rice into a bowl and pour lukewarm water into the bowl. 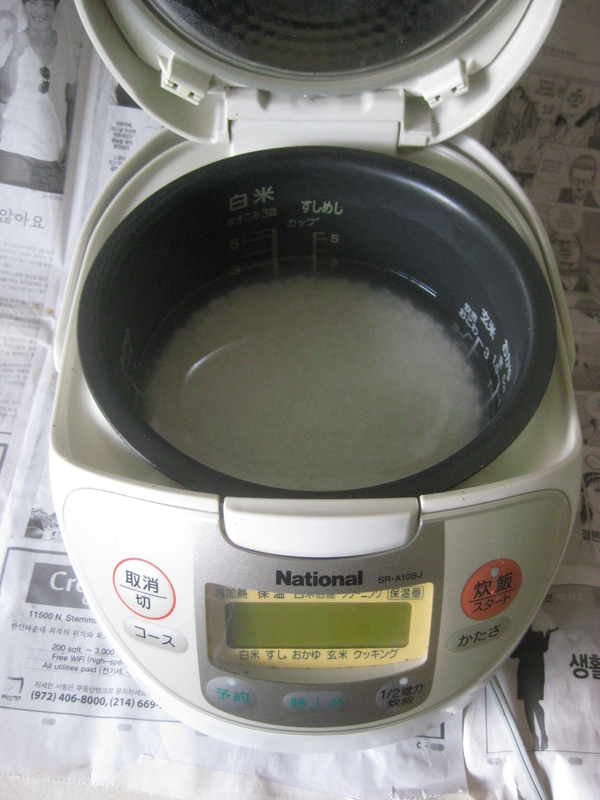 Next, wash the rice by hand until the water becomes white and cloudy. 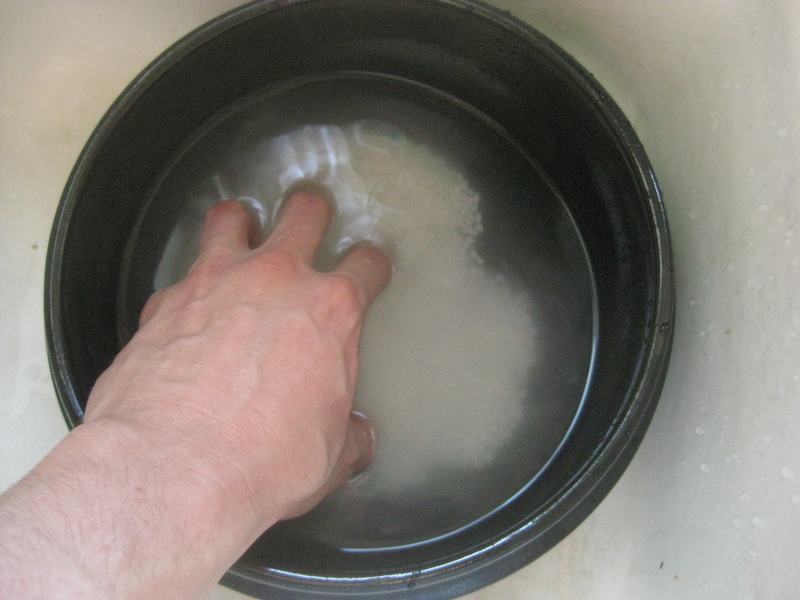 Next, without letting the rice out of the bowl, pour out the water and repeat the process until the water is no longer cloudy. 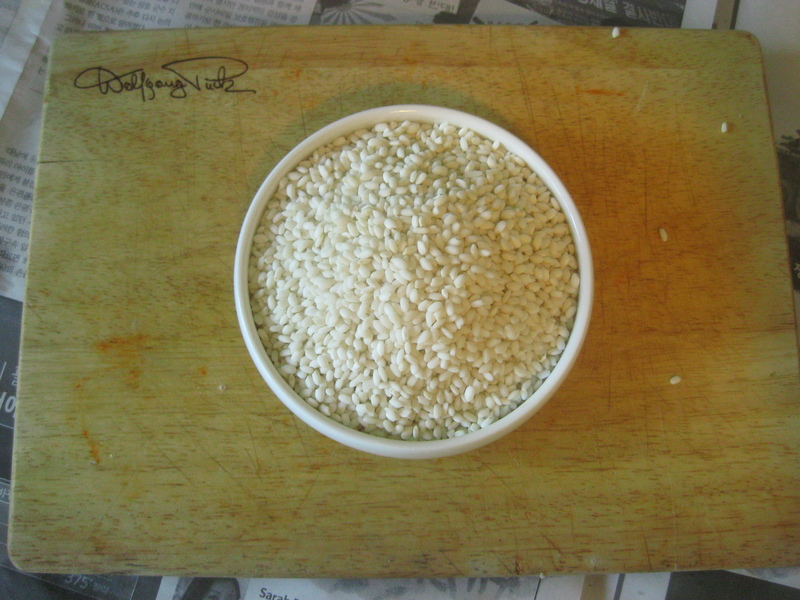 Then put the glutinous rice into a small bowl. It will be a little caked together, but this is okay. 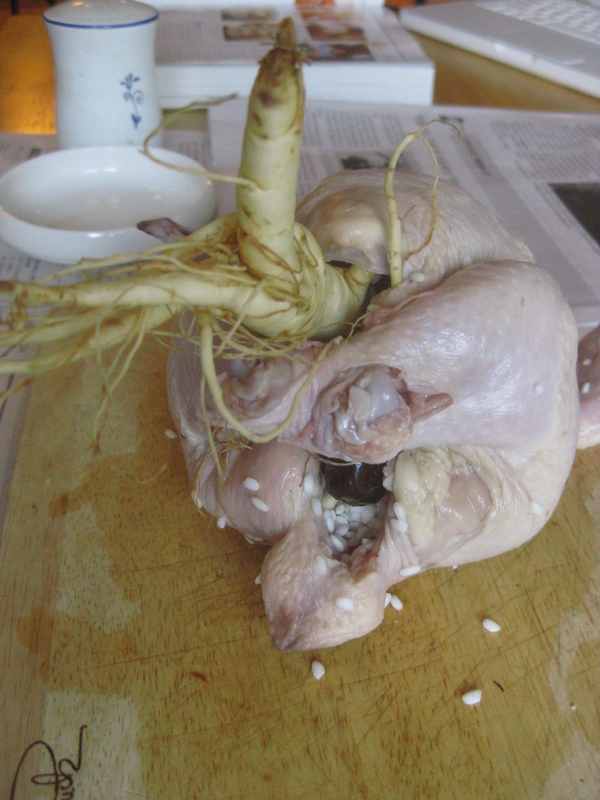 Wash the Ginseng Root: Take a toothbrush and put the root under running water and brush the root to get any dirt off. 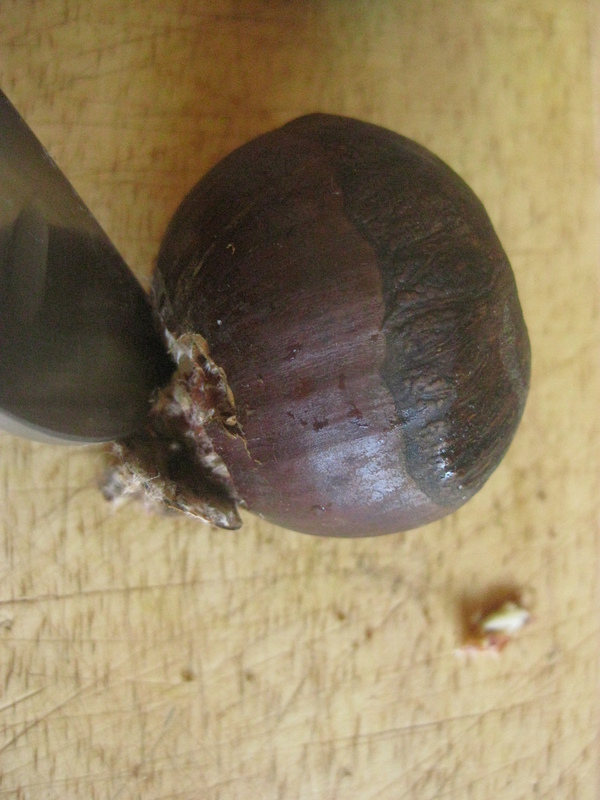 Preparing the Chestnuts: Prepare to cut a whole into the shell of the chestnut in order to remove the husk. 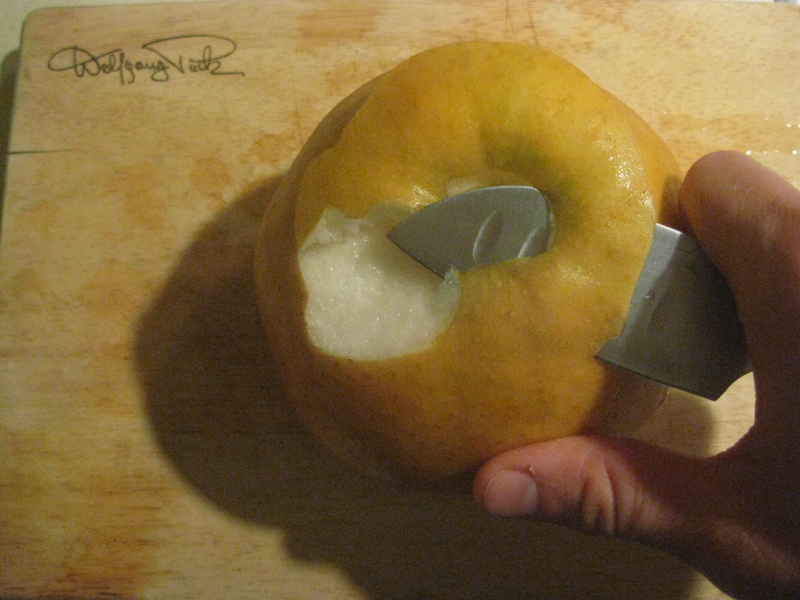 Use the tip of the knife. Now remove the rest of the shell. 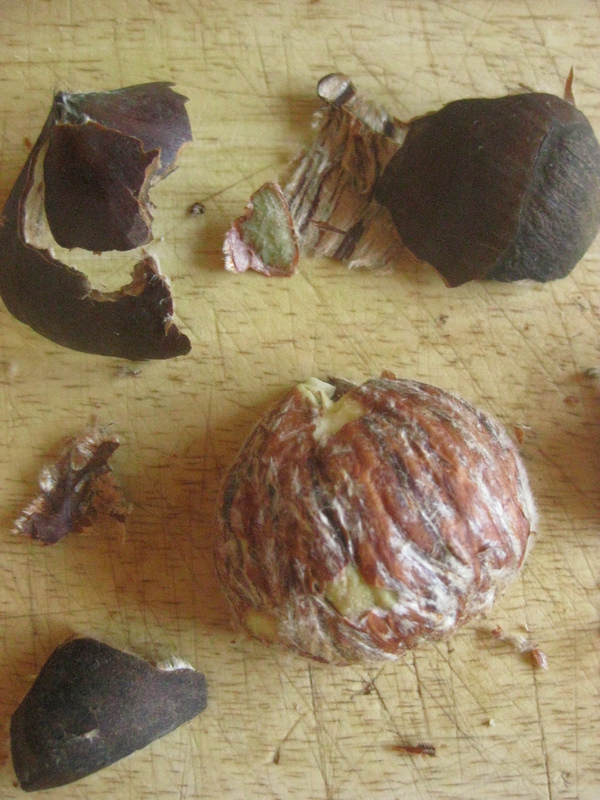 ….and the husk. 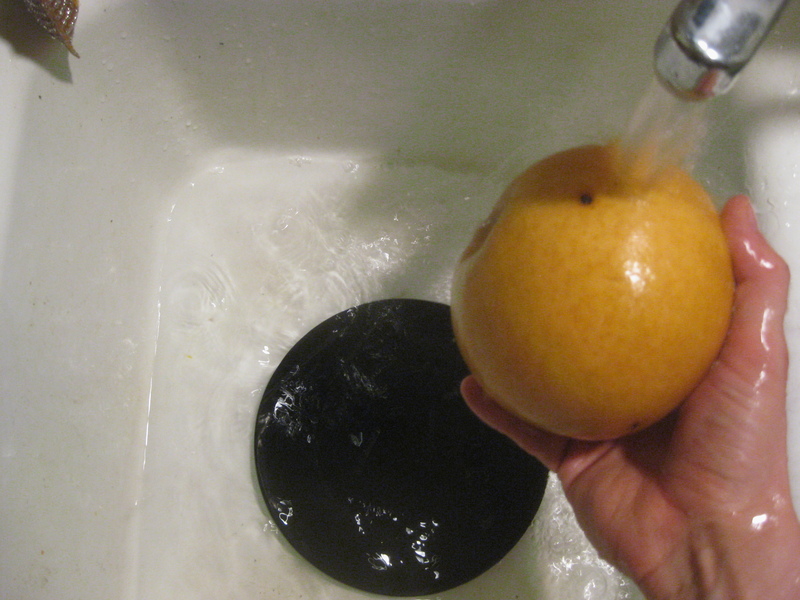 Wash the Dates: Wash the dates in lukewarm water. Stuffing the chicken: Now you are ready to stuff all the ingredients into the chicken’s stomach. Begin by putting all the rice in first. And stuff it in as tight as you can. 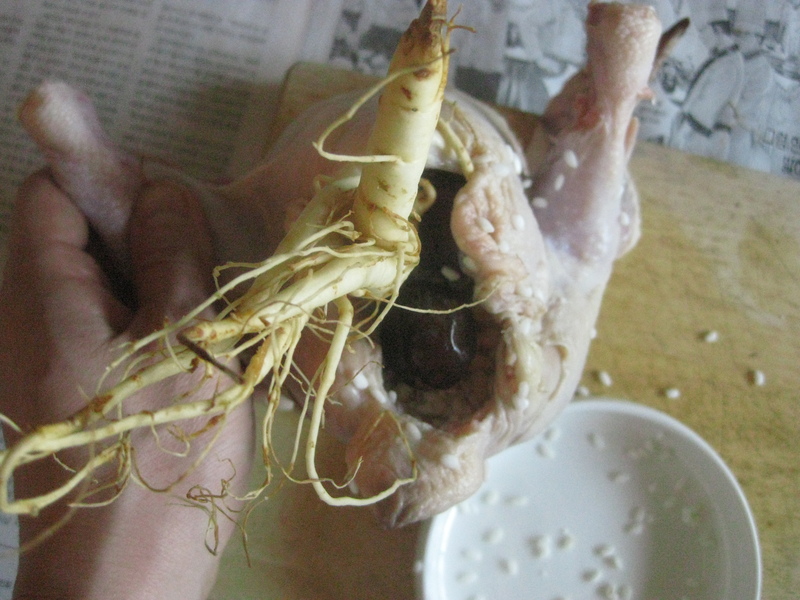 Next put in the Ginseng root as far as it will go. 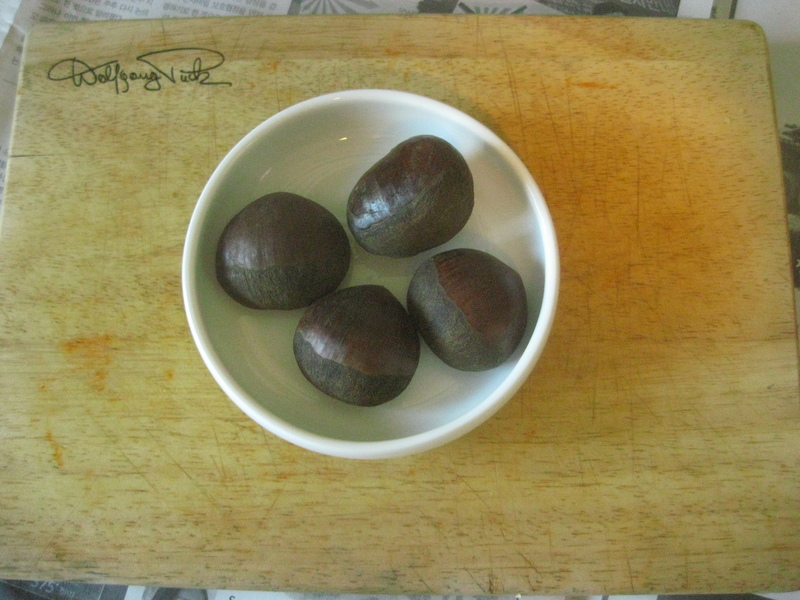 …and then two dates and one Chestnut with a few pine-nuts. 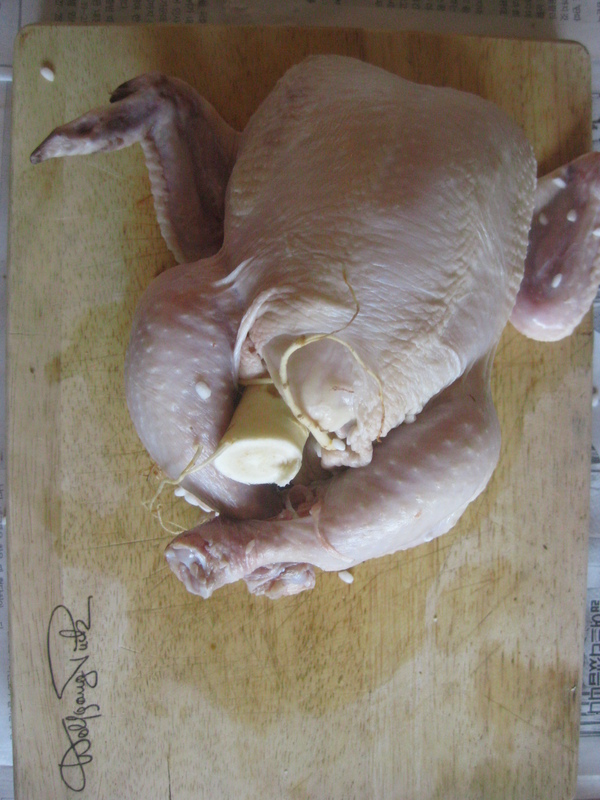 Now, put the chickens right leg through the hole in the left leg to fasten everything inside the chicken. So that when the chicken is cooking, the ingredients wont come out. 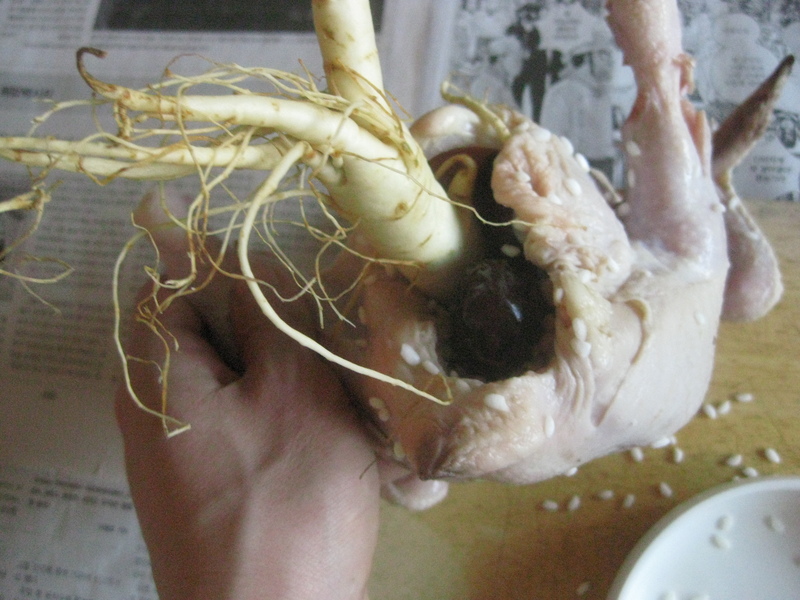 Cut off the part of the Ginseng root that is still protruding from the chickens body. Cooking the chicken: Put the chicken into a standard pot. 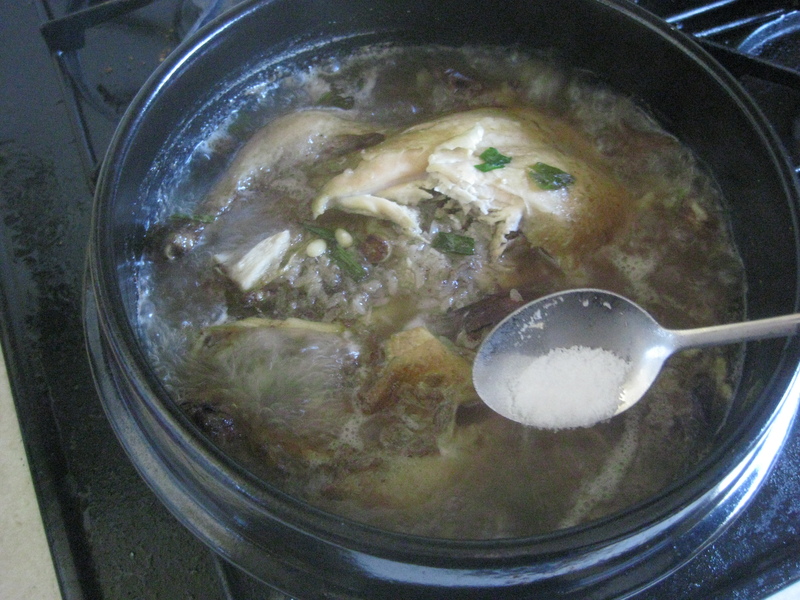 …and fill the pot with water until the chicken is submerged. 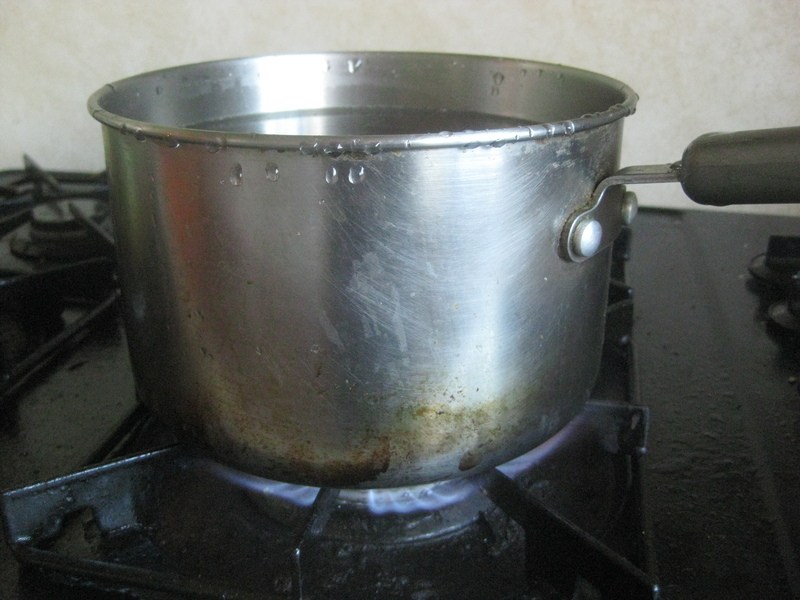 Place the pot onto the stove and turn the heat on high and bring the water to boil. 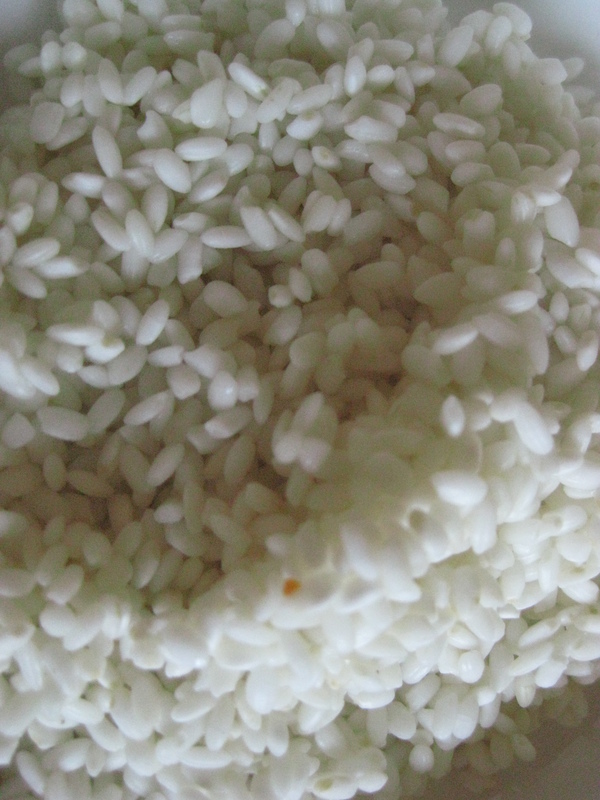 Once it has reached a rolling boil, turn the heat down to low and let sit for 2-3 hours until the rice has thoroughly cooked. It wont hurt to cook it as long as 3 hours. Every once in a while check to see how its doing. 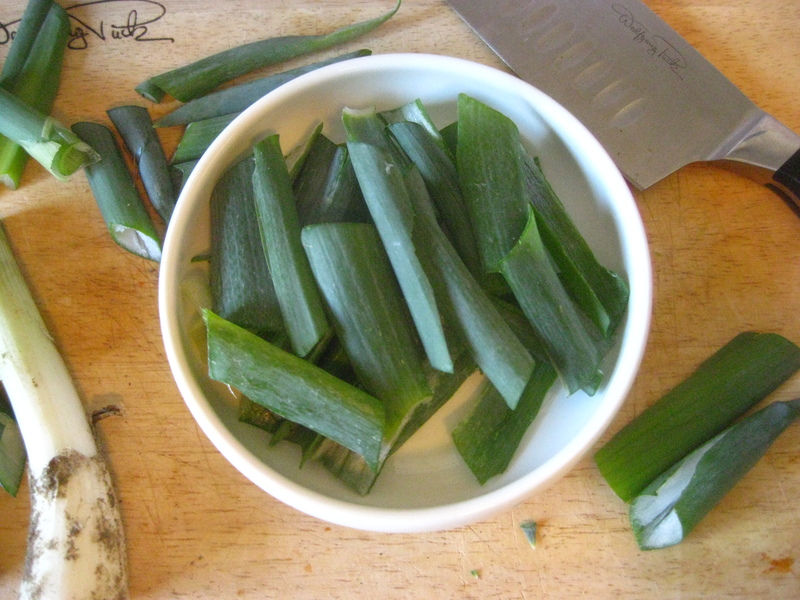 Prepare the green onion as garnish: Wash the stalks in warm water. 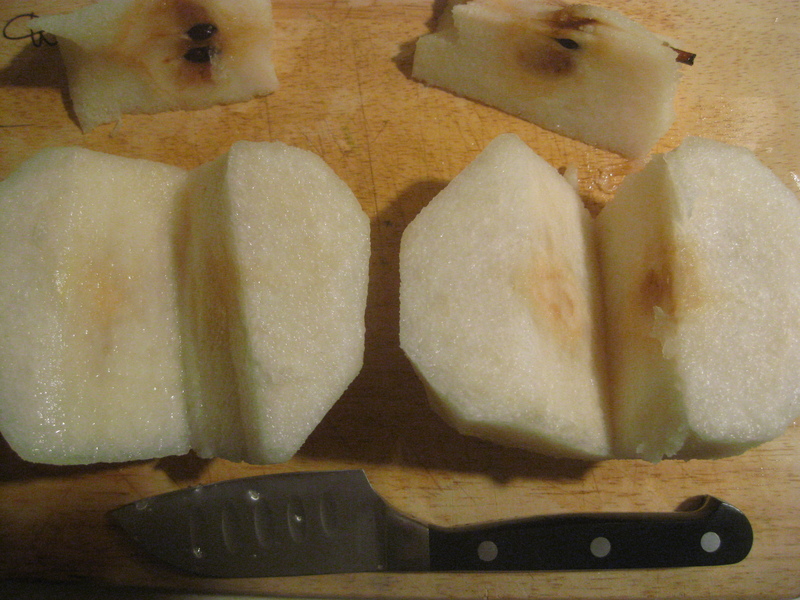 Then cut the stalks in half and continue cutting into smaller pieces. 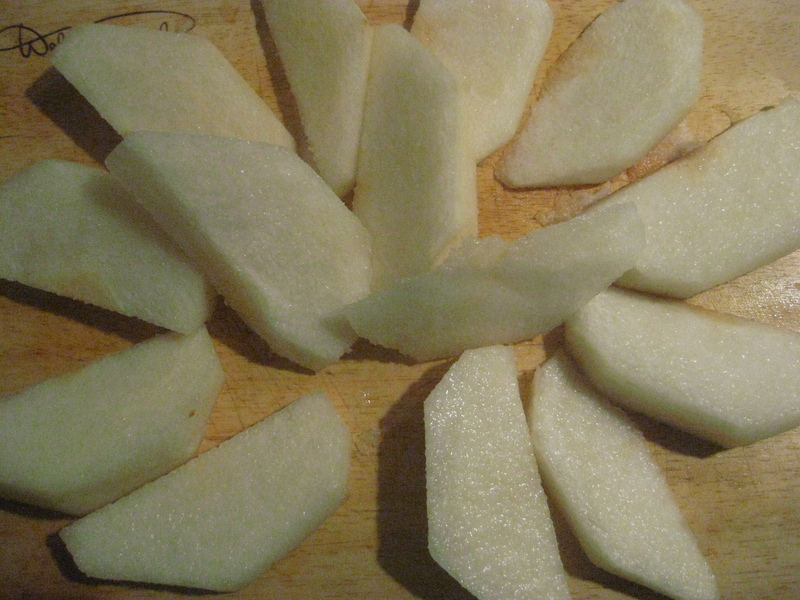 Once the dish is completely done and ready to be served, lightly sprinkle the slices in the dish as you like. 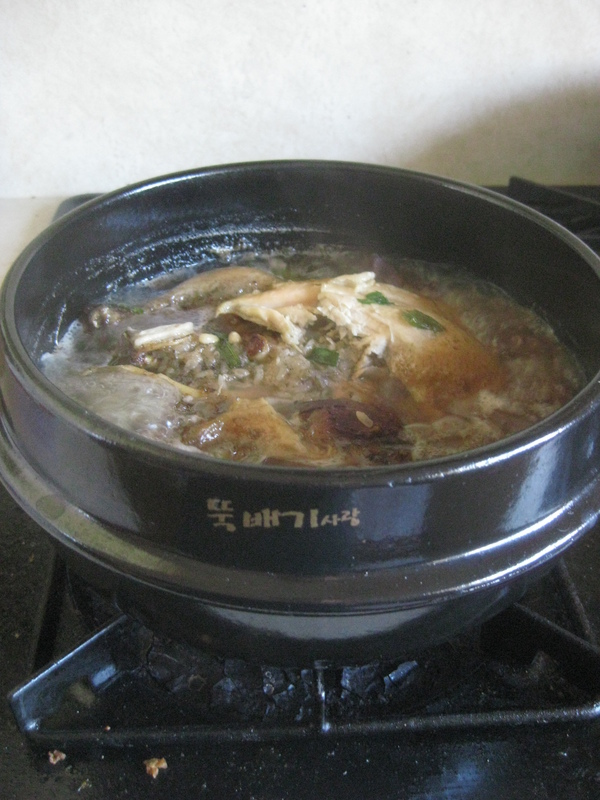 Moving the chicken into the Dook-Bae-gi: Once the chicken has thoroughly cooked, move the chicken into the Dook-Bae-gi and then pour the broth from the pot in as well. Now bring the stew to a rolling boil once again and then turn the burner down. Let cook for an additional 4 minutes and then add salt. Now remove the Dook-Bae-gi from the burner and set on your table. And add green onions as garnish. . . . . .
Find a suitable place on your floor to put your table, and place a burner placemat in the middle of the table and place the Dook-Bae-gi on top of it. 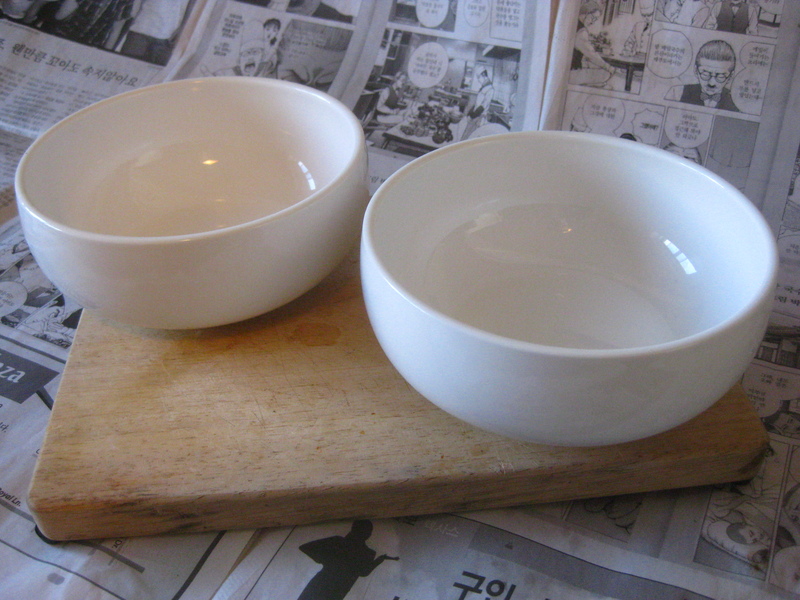 Set your medium sized bowl in front of you and place the chopsticks and spoon to the right of your bowl. Place the salt and pepper bowl near your bowl and place the Korean floor pillows in the places where you and your friends would like to sit. 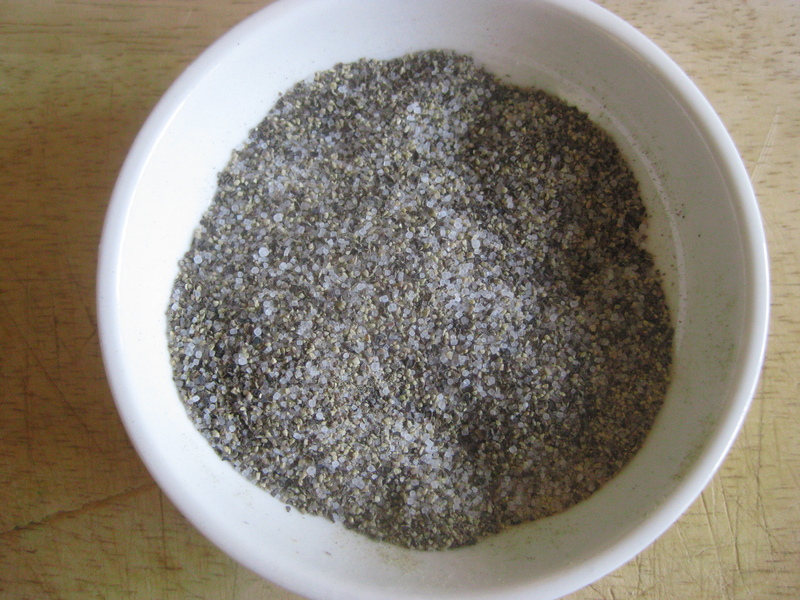 As you are eating from the Dook-Bae-gi, dip the chicken pieces into the salt and pepper mix to add flavor. Great job! 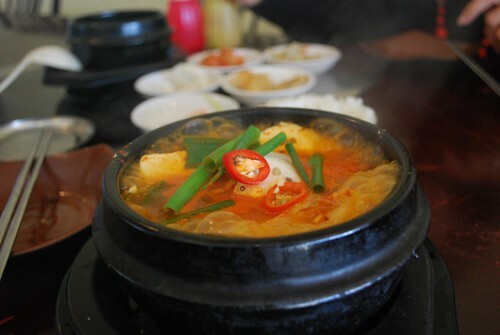 김치찌개 Kimchi Jigae — a fiery bowl of passion! Lets craft a dish our tongues will record in history! Kimchi Jigae 김치찌개!! Its so easy to make and you will never settle for Ramen noodles again! It will also keep you warm in the winter! 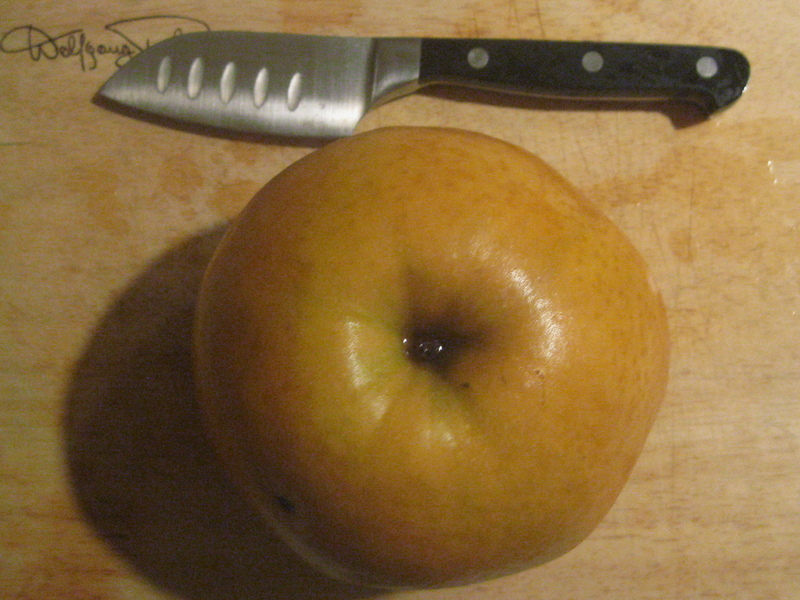 The following ingredients are probably unfamiliar to you, so during the post, I will have photos of the ingredients. 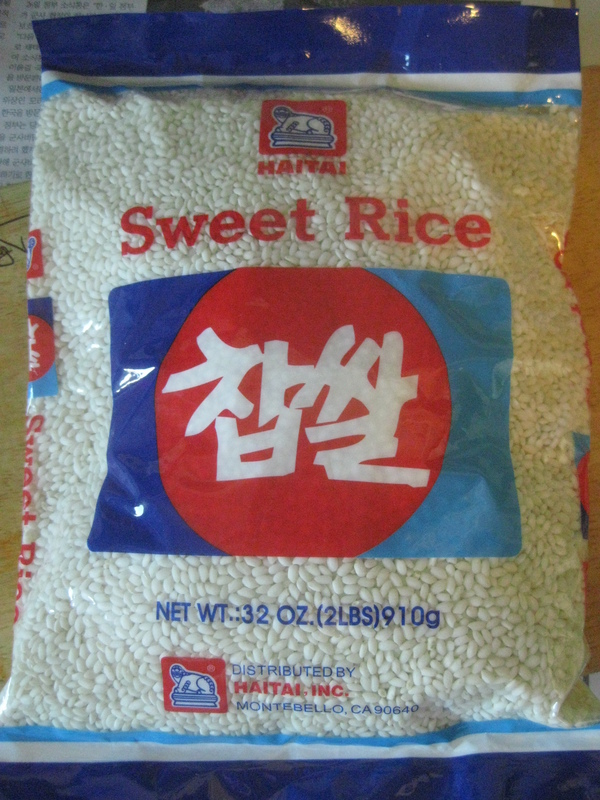 I will also include a list of the ingredients written in the Korean language. If you aren’t as gutsy as some, print the out the ingredients in Korean and use it as a cheat sheet. When you arrive at the market, just show someone and they will be more than happy to help you. Korean people can be very endearing and they are some of the most helpful people I have ever met. Before I send you on a mission to buy ingredients for Kimchi Jjigae, I wanted to give you the chance to really get into the culture, so I listed some items below that are an integral part of Korean cuisine. Most of these items can be found at a wholesale kitchenware store or an E-Mart / Lotte Mart. .Frying Pan – A frying pan is only necessary if you choose not to purchase a Dook-bae-gi. 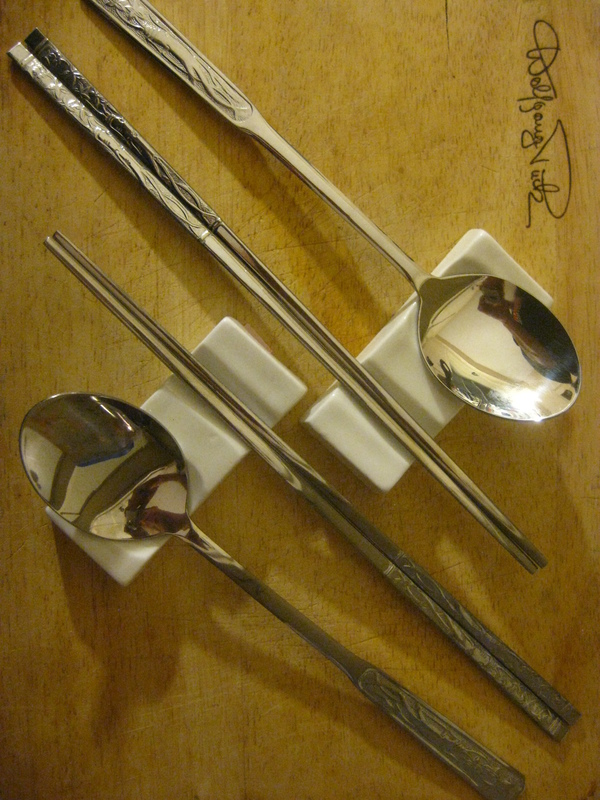 Silverware – A pair of metal chopsticks and one soup spoon per person. I recommend buying at least 4 to 6 if you want to have friends over. 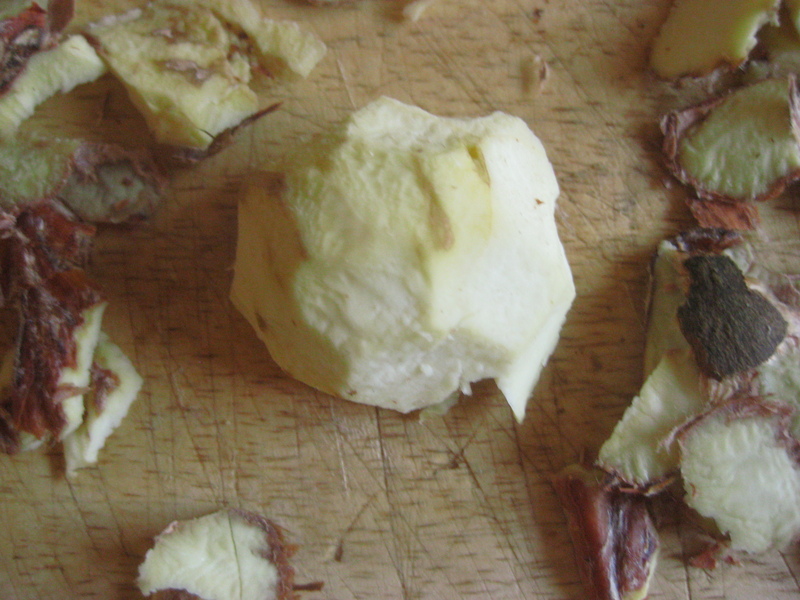 Soup Ladel – Necessary for scooping the stew out of the pot and pouring it into your bowl. Tupperware – One medium sized bowl per person. This is so that you can pour the stew from the Dook-bae-gi into an individual bowl of your own. 6 small bowls for side dishes (various side dishes filled with Sliced Radish Kimchi, Sesame leaves, Jalapeno Peppers in pepper paste, season fish, Lotus root in soy sauce, and Kimchi, respectively. This is the traditional way of eating and sharing a meal). 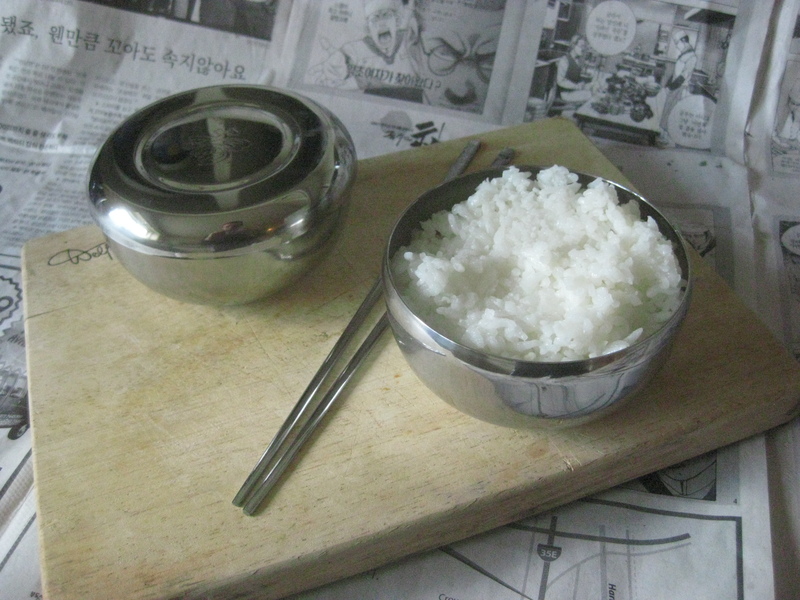 And 2 – 6 metal rice bowls for white rice. Traditional Korean Floor Table 밥상 – Pronounced, “Bap-Sang”, this is the traditional way friends and family eat in Korea; sitting on the floor at a table that is one foot from the ground. Its a fun way to eat sitting on the floor. Gas Range Grill (with gas canister) – This is a portable gas range that you will set on top of the floor table when you are ready to cook. A small can of gas can be plugged into the side of the grill. These are easiest to find at E-Mart or Lotte Mart. 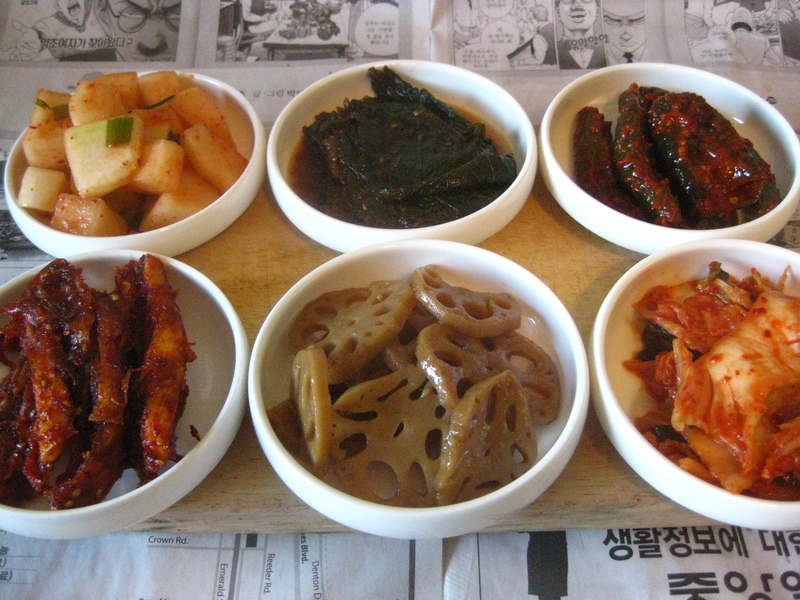 Ingredients for Side Dishes – It is tradition to eat side dishes during the coarse of a Korean meal. 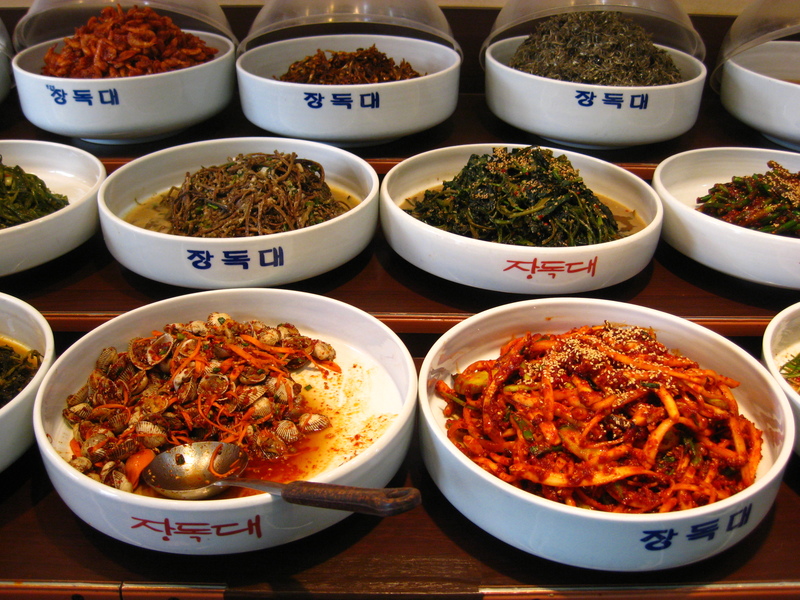 You can find a wild assortment of side dishes at a side-dish specialty shop or E-Mart or Lotte Mart. What you choose to put in your side dishes is up to you, so have fun and try new things. But if you would like some ideas, I can offer you some suggestions. 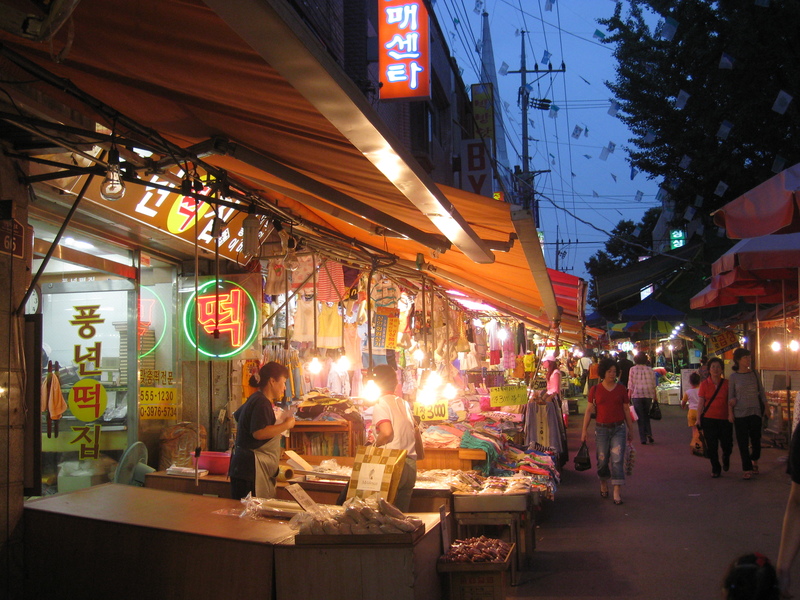 The sign on the left reads, 반찬, “Ban Chan”, which means “side dish” in the Korean language. Shops that specialize in side-dishes. 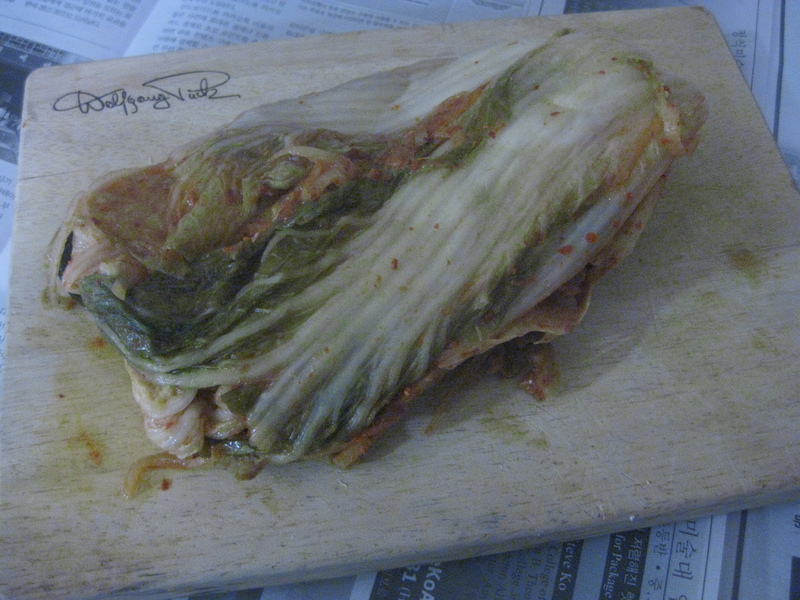 Kimchi: when shopping for kimchi, little shops that specialize in Korean side-dishes are perfect. You could go to the local E-mart to get kimchi, but the best quality is found in the small shops. Plus, these shops usually have a large variety of kimchi to select from. 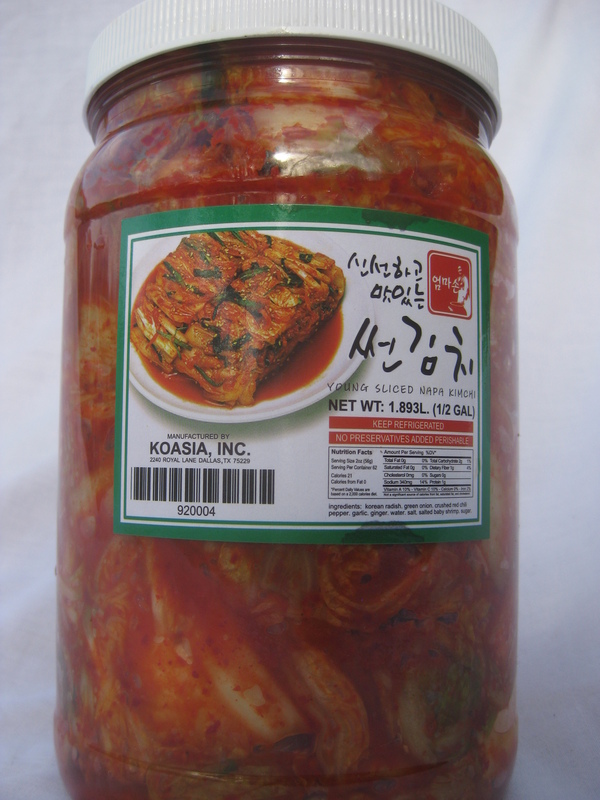 However, when making “kimchi jjigae”, its best to use kimchi that has a strong pungent vinegar taste. This enhances the flavor. Just let the shop owner know that you are making “kimchi jjigae” and he will be able to direct you. Pork: if you can find an open-air market when shopping for meat, great! But, there are also plenty of butcher shops as well. Either lean pork or fatty will work for the dish, it just depends on your preference. I like fatty cuts of meat, because fat always holds more flavor. 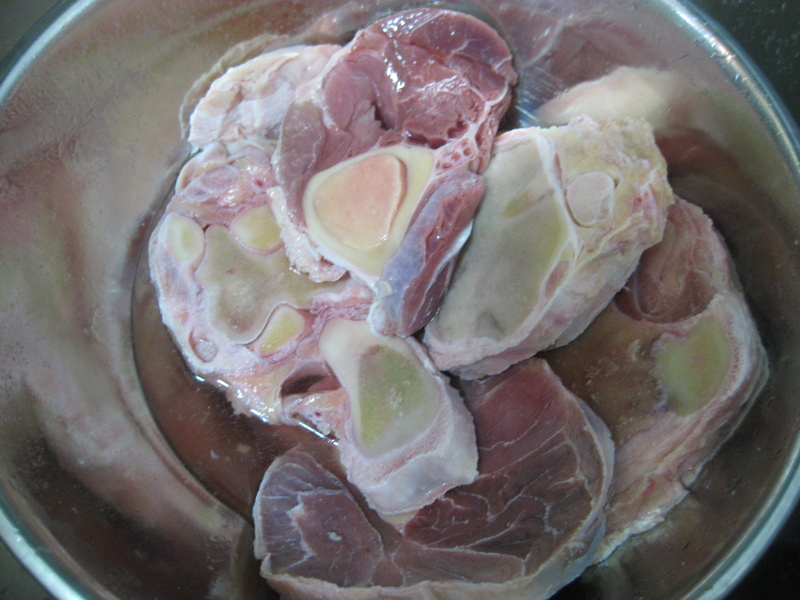 Simply put the pork in a bowl and mix it with half a cup of oil and gently massage the meat. White rice cake: There are shops that specialize in making “Ddeok”(떡). 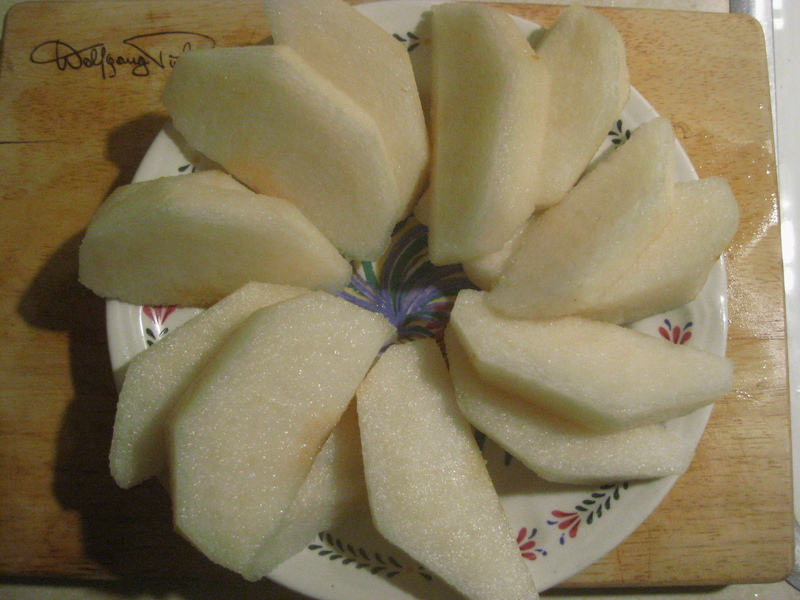 “Ddeok” is Korean for “rice cake”. 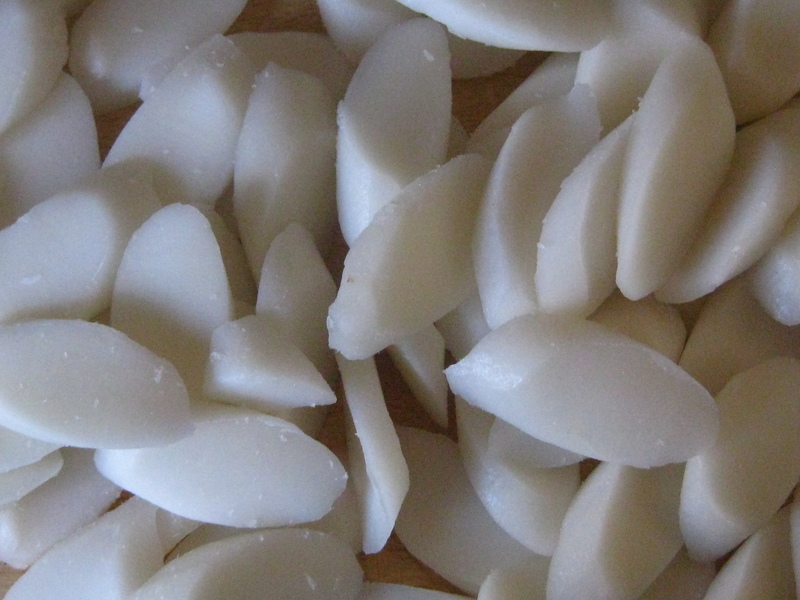 These shops are the places where you will find all kind of varieties of rice cake. Look for the signs that say, “떡“. 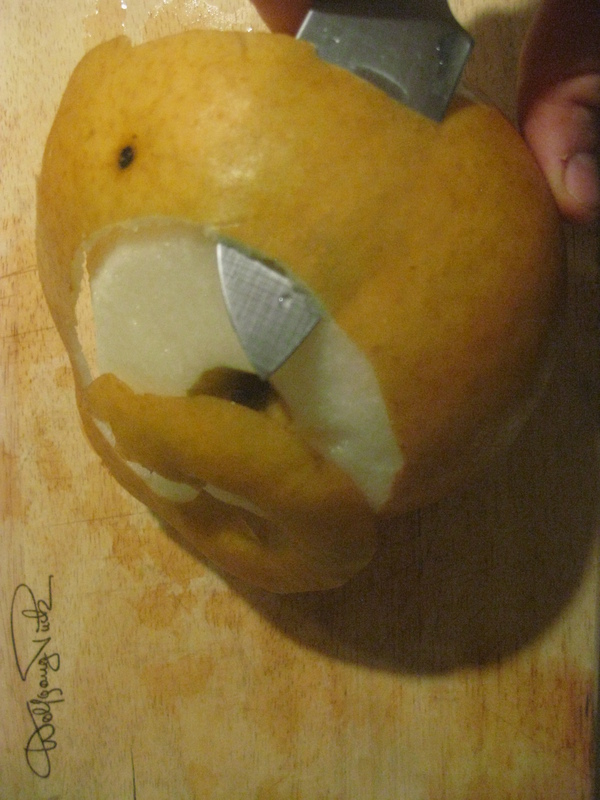 Ask for sliced ddeok, but if you cannot find sliced ddeok, you can always cut it yourself. Make sure that the ddeok is white. 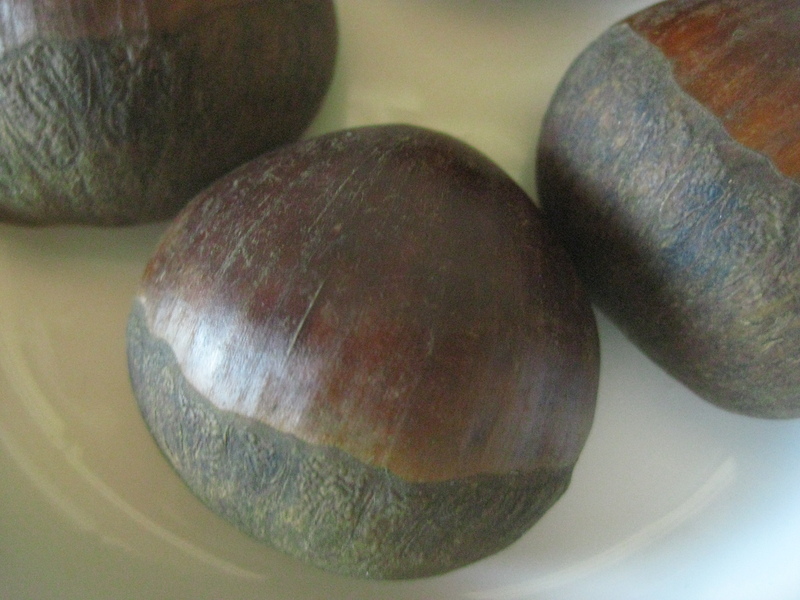 When Korean Thanksgiving comes around you will find lots of ddeok in the area. Korean Thanksgiving is called “Chu-sock”(추석). 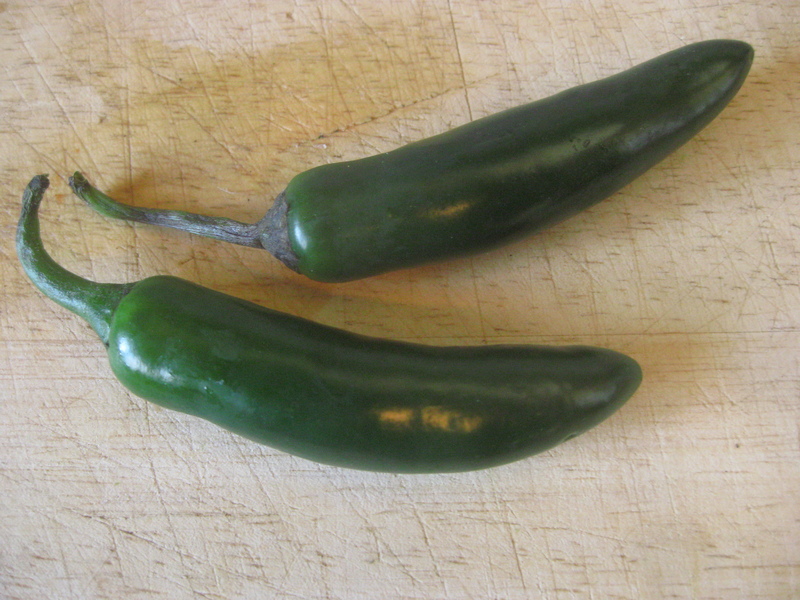 Thick Green Onion/ Garlic/ Ginger/ Jalapeno Pepper / Chili powder: The following items can be found in an open-air produce market. 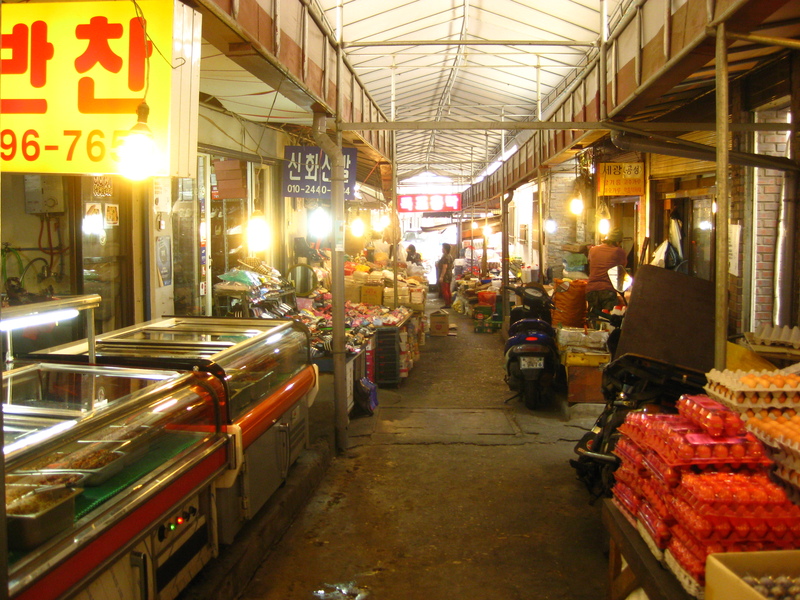 If you are in Korea during the spring or summer time, finding an open-air market should be easy, but in the winter time, its more difficutl. But if you are determined enough, you can find one. 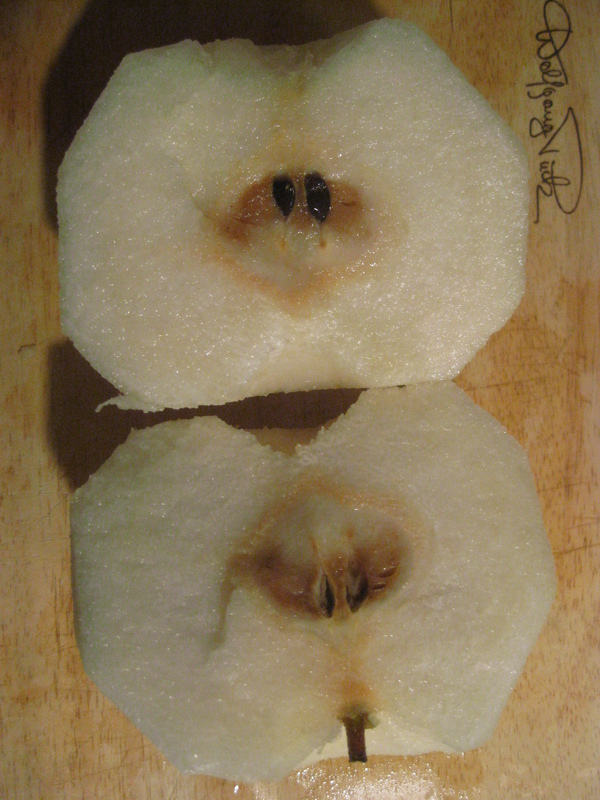 When purchasing these items, always examine them beforehand to determine its freshness. 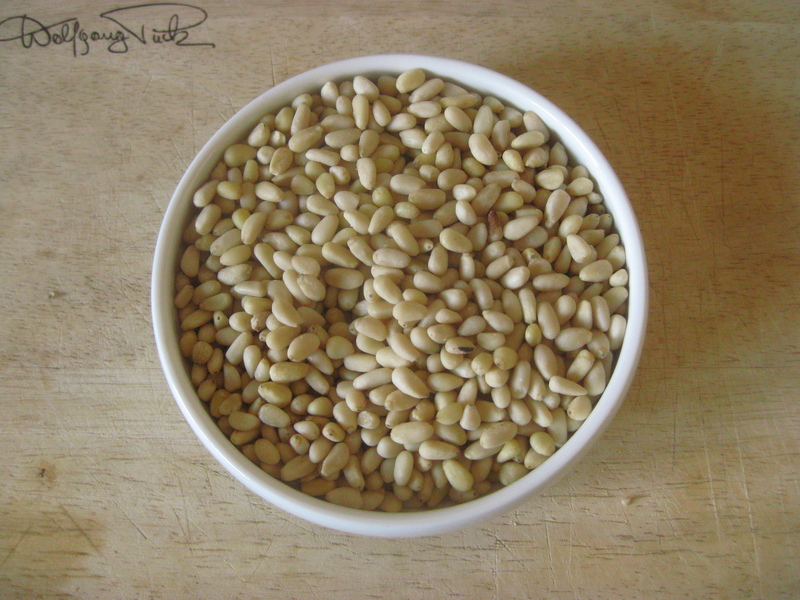 Sesame Seed Oil: Sesame seed oil can come in a small bottle or a large metal can. 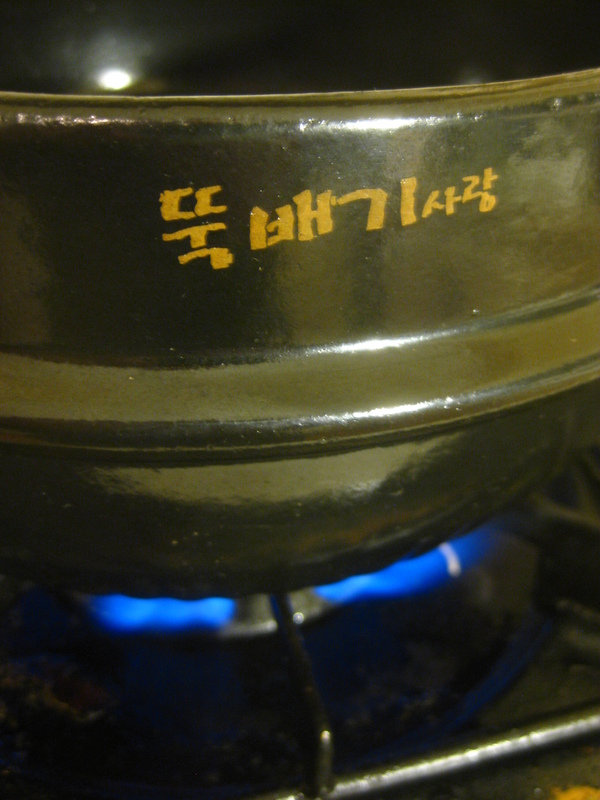 If you find a large can, it will have a plastic lid on top and writing on the side that says, “참기름”(Cham-gi-rum.) You can find sesame seed oil in a grocery store. Look for an E-Mart, Grand Mart, or a Lotte Mart in your area. Meat Broth: You can easily find a can of meat broth at a local grocer or E-Mart, etc. 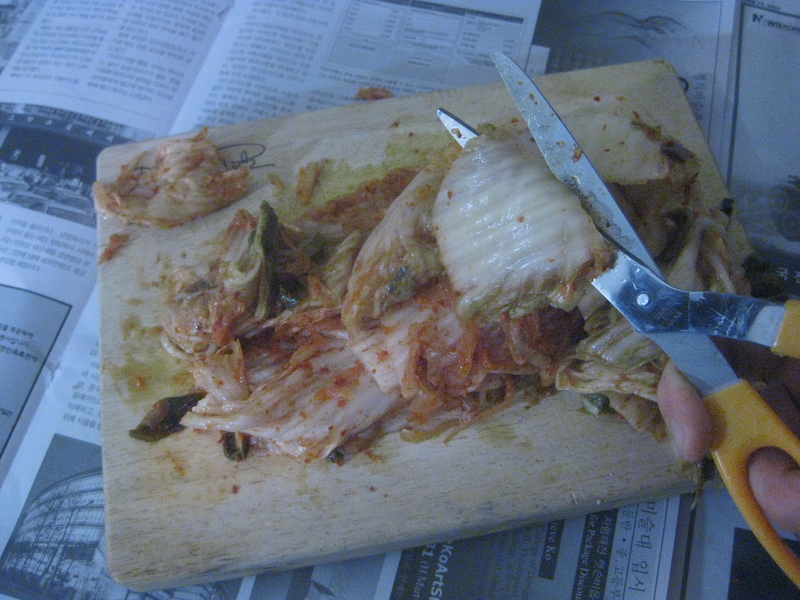 Kimchi: With scissors, cut the kimchi into coarse 2 inch pieces. 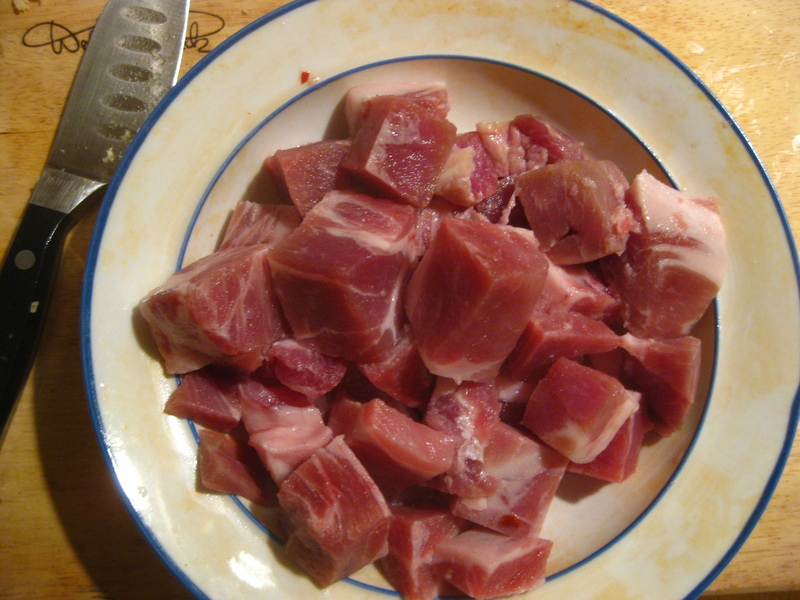 Pork: Coarsely chop the pork into 1-2 inch pieces, then put in into a bowl. To make the pork more tender and flavorful, mix it with a small amount of oil. Then work the oil into the pork by hand. 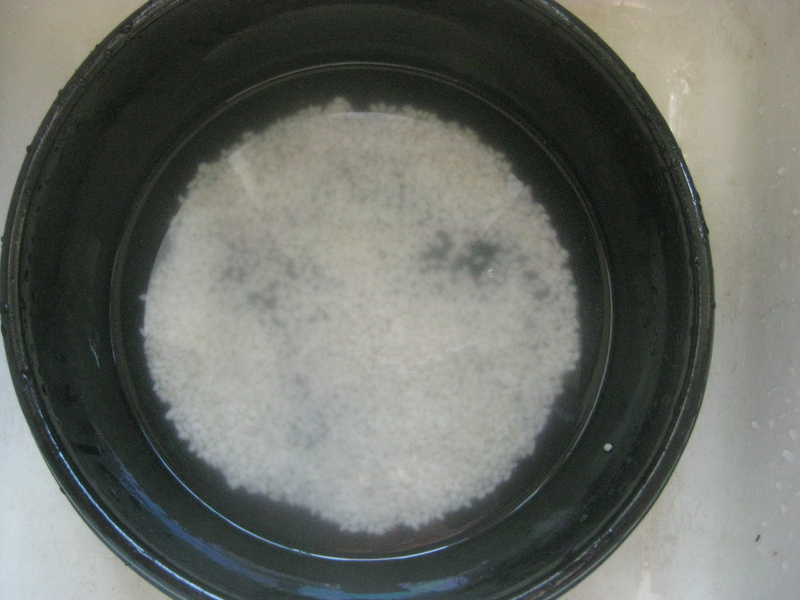 White rice cake: Lightly rinse the cake in running water. If the cake is especially hard, soak in lukewarm water until it becomes soft. 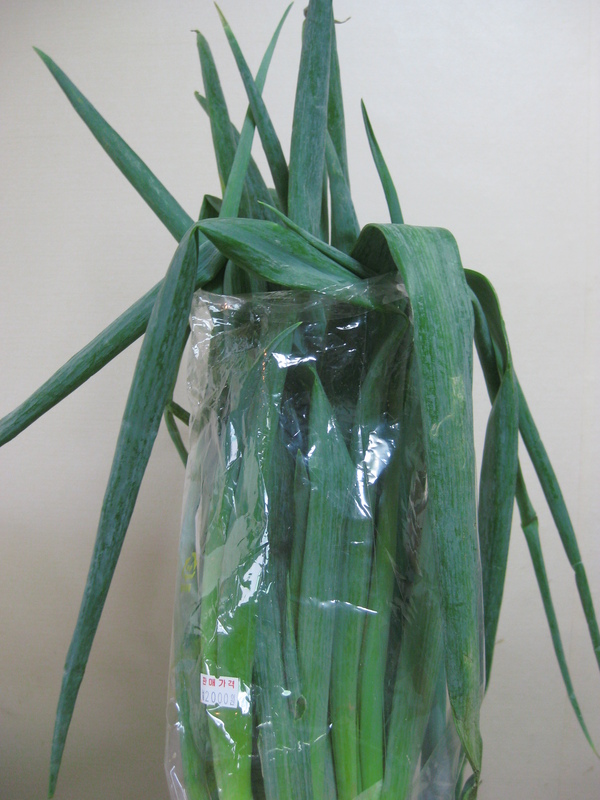 Green onion: Rinse in running water. 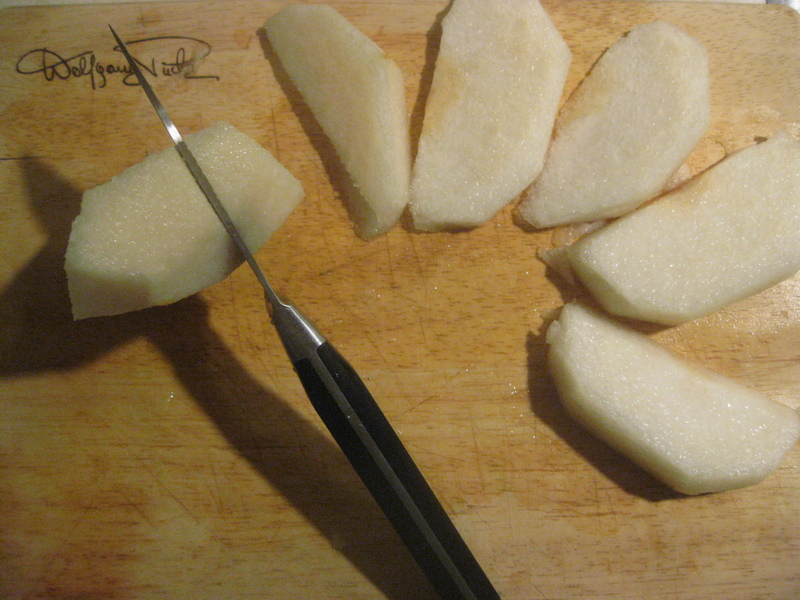 Cut the stalks in half, then coarsely cut the stalks into 4-5cm pieces. 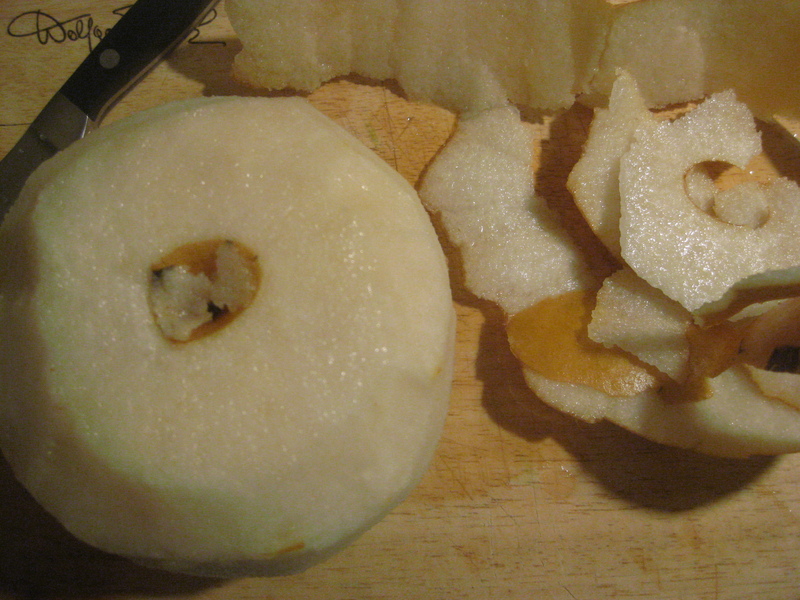 After this, tear each piece into shreds, evenly from top to bottom. 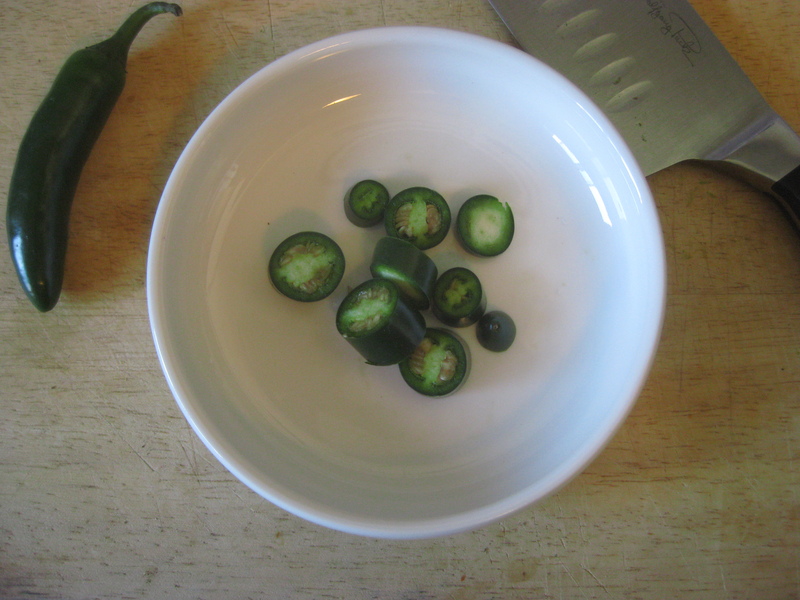 Jalapeno Pepper: Rinse in water, cut in slices and use discretion when adding. 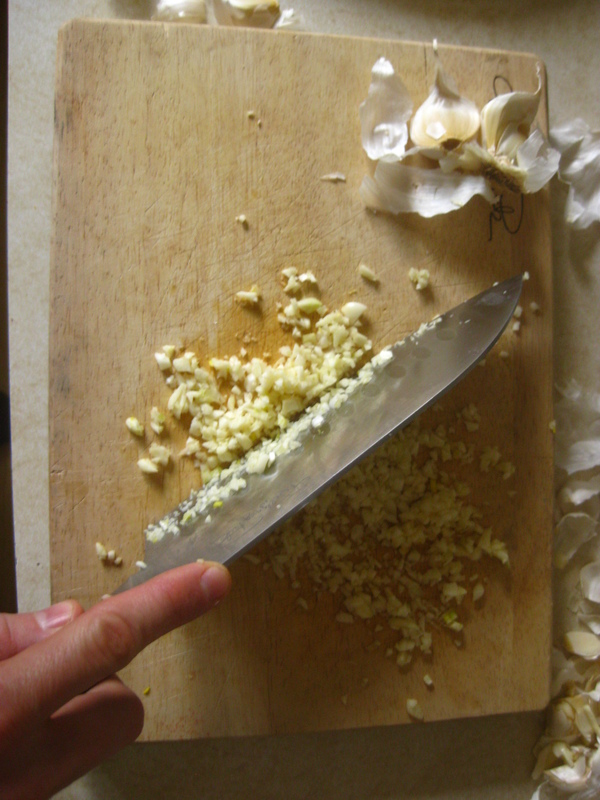 Chili Powder: Chop the garlic and ginger until minced. 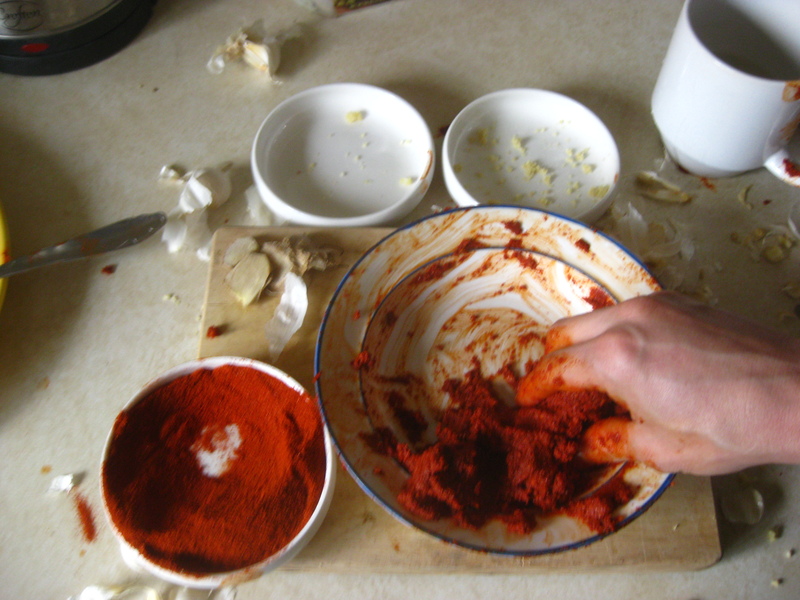 Then mix the minced garlic and ginger into the chili powder until it becomes like a paste. Now you are ready to mix all three together. 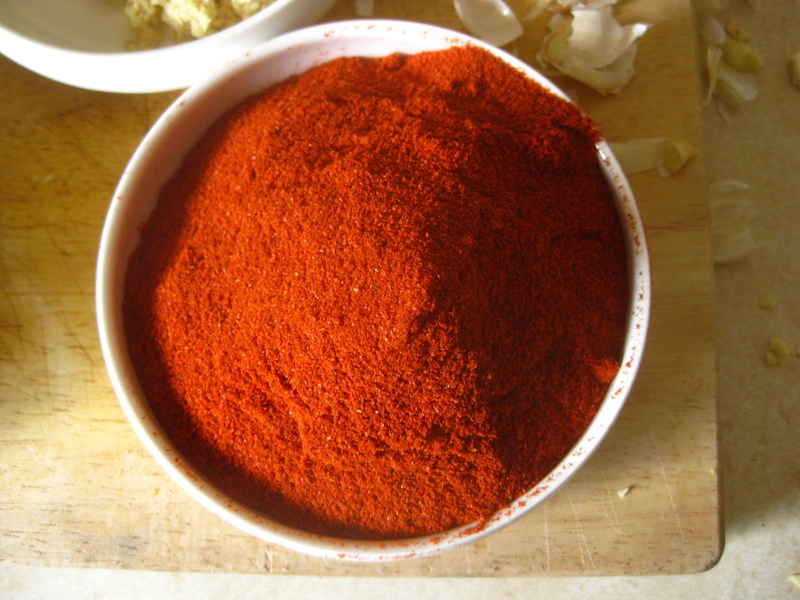 …mix the ginger, garlic and chili powder by hand. 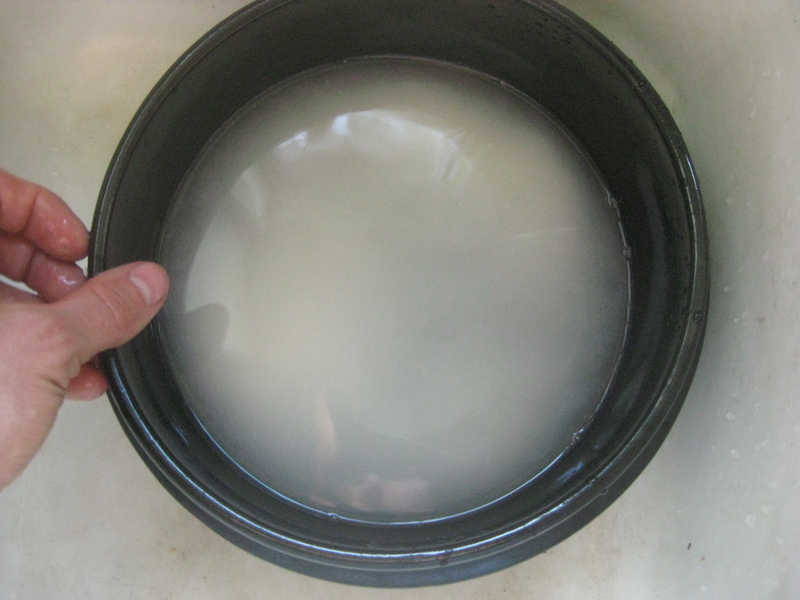 …add a little water until the mixture becomes like a paste. 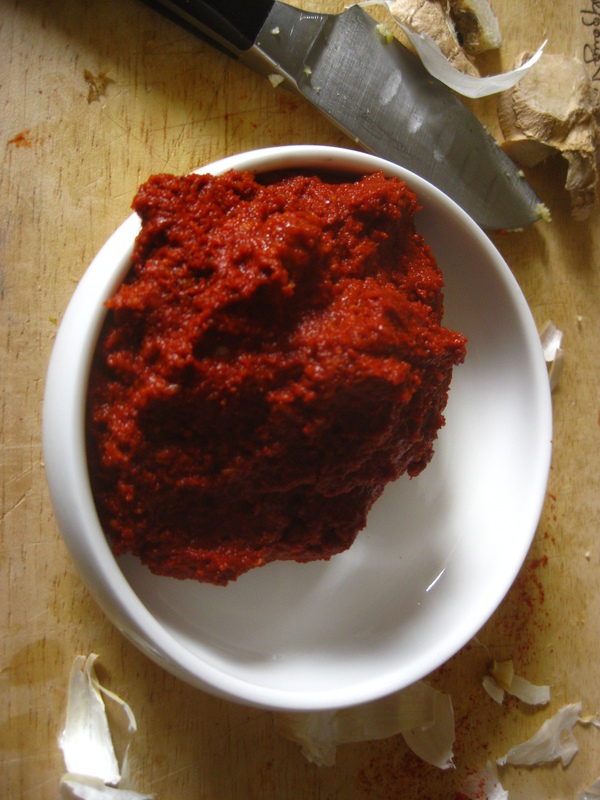 Now you have red pepper paste. Find a suitable place on your floor to put your table, and set the gas range in the middle of the table and put the Dook-Bae-gi on top of the gas range. Set your medium sized bowl in front of you and place the chopsticks and spoon to the right of your bowl. Put the side dishes to the left and right on the table where you can pick from them while you are eating. Place the Korean floor pillow in the place where you would like to sit. 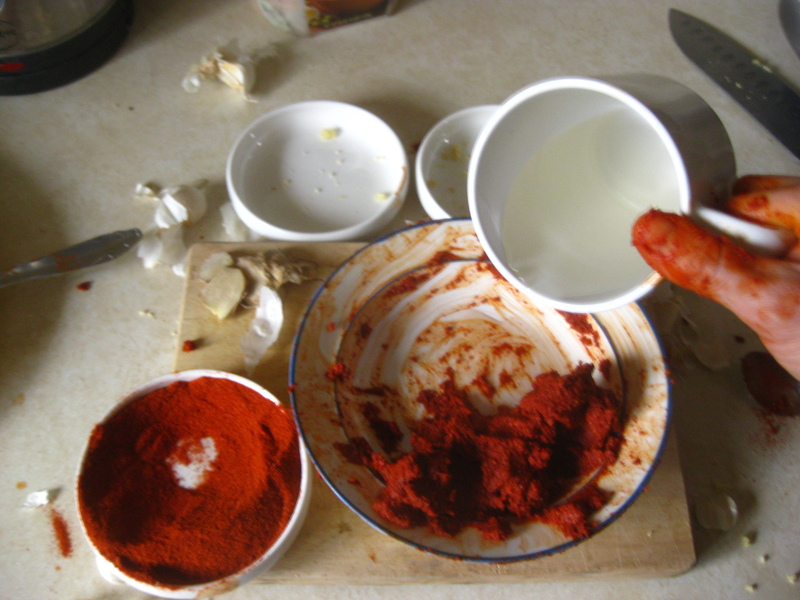 Begin by placing the chopped kimchi into the pot, followed by the spicy pepper paste. After this put in the pork, coarsely chopped onions, minced garlic, sesame seed oil and the MSG[optional]. After this, pour in the meat broth until the pot is almost full- about an inch from the top. Every ingredient except the white rice cake. We will save that for last. Next, bring the stew to a rolling boil. Then decrease gradually until the roll of the boil is slight. 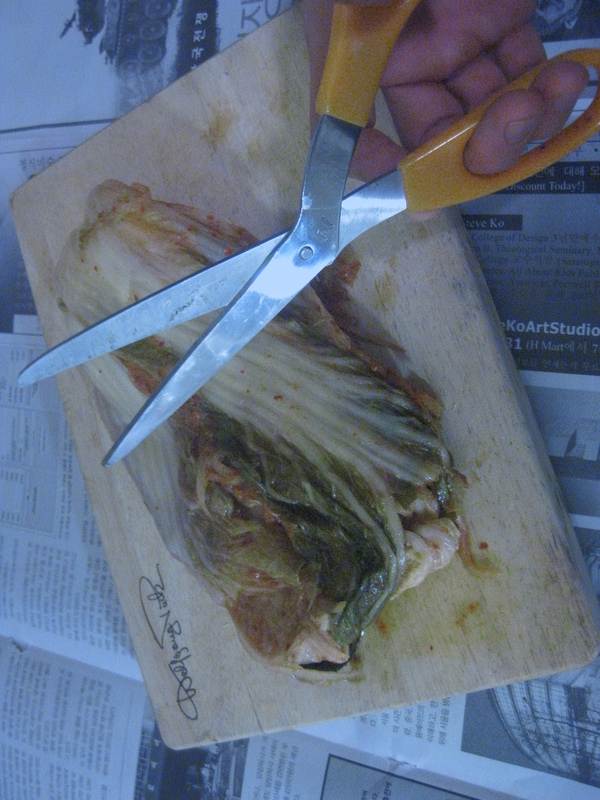 Let this continue until the kimchi has become soft and tender. So every once in a while check the kimchi. 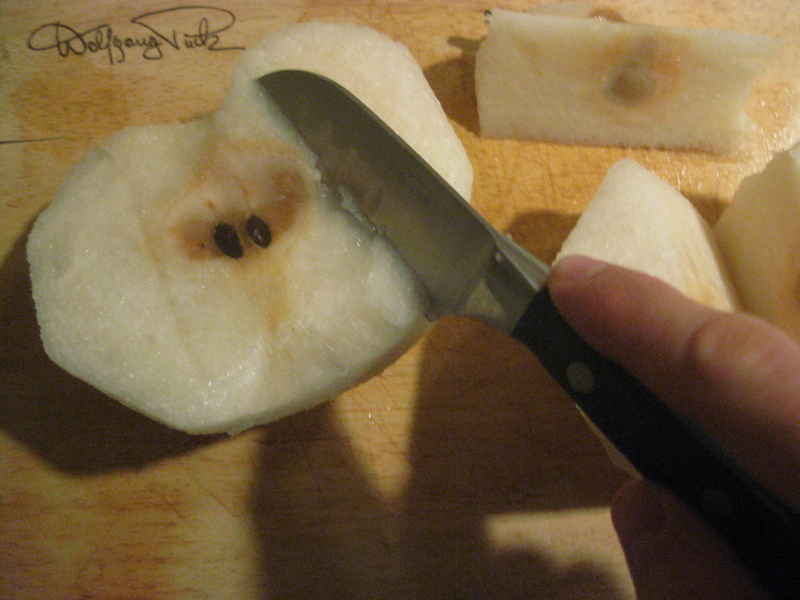 (It should take the stew around 30 – 45 minutes to cook.) 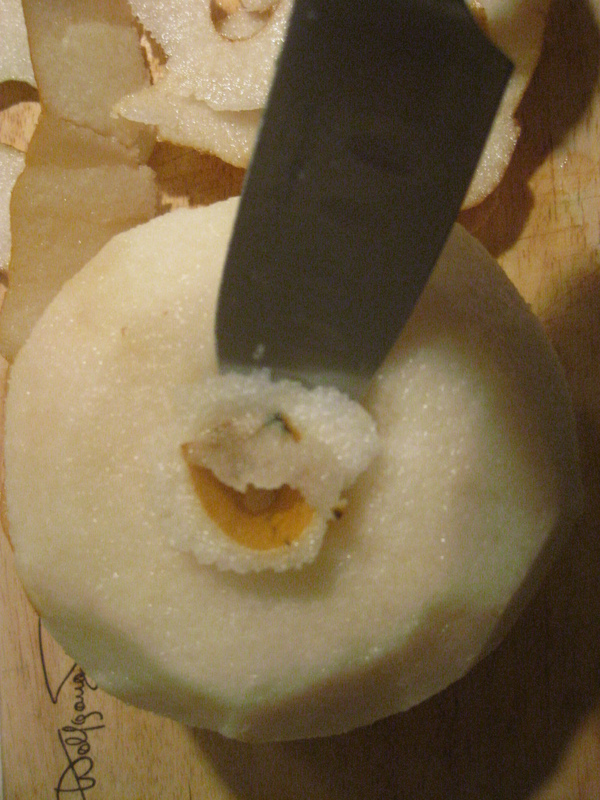 Once the kimchi has tenderized, turn the burner down to low and add rice cake. Let cook for another 10 – 15 minutes. 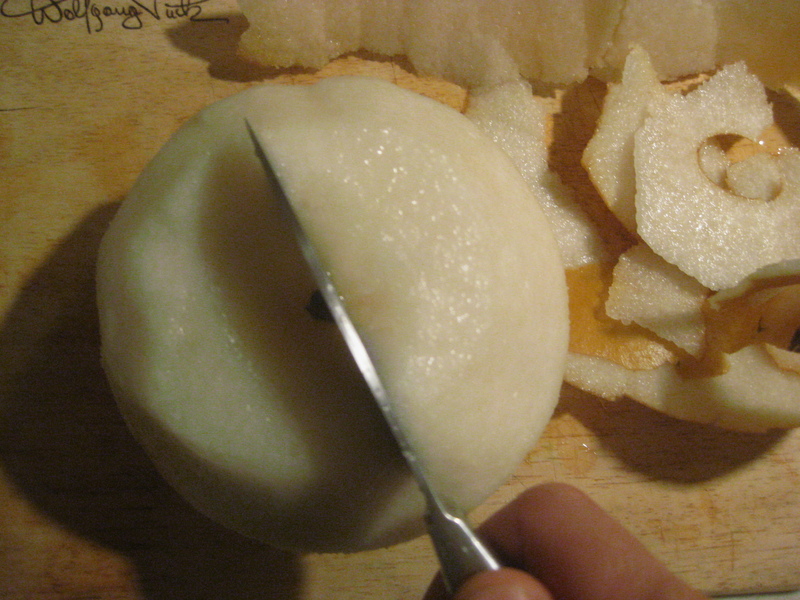 Once the rice cake has softened its ready to eat. Take your soup ladle, dip it into the pot of freshly cooked Kimchi Jjigae and pour yourself a nice steaming bowl! And pat yourself on the back for a job well done!